If you're a suitably fortunate madamu, you wouldn't be caught dead in your husband's favorite, smelly neighborhood robata-ya restaurant. However, that doesn't mean you would completely eschew the idea of charcoal-grilled altogether. You just want it to be a little more elegant... and perhaps a little less heavy on the smoke. 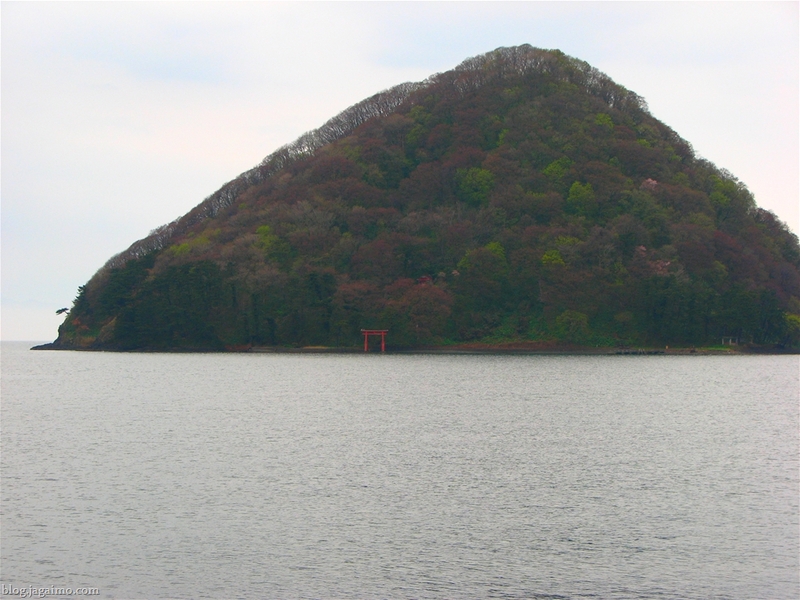 For those well-heeled women, there is Yasaiya Mei, a high-drama robata-ya in the sparkly, mine-like structure known as Omotesandō Hills. Hiromi and I had eyed this spot after our previous outing to Omotesandō, and put it on our list of places to come back to. The dinner menu was out when we first walked by in the late afternoon, and it was fairly tempting, so we tried to find an excuse to come back. We made plans for lunch with Kristin of eGullet and some of Hiromi's friends for a weekend lunch, and ended up choosing this spot since absolutely none of us would be able to make it there for lunch on a normal workday. For most of us it was a bit of a splurge, certainly for lunch, though some people got away with a slightly less expensive set. 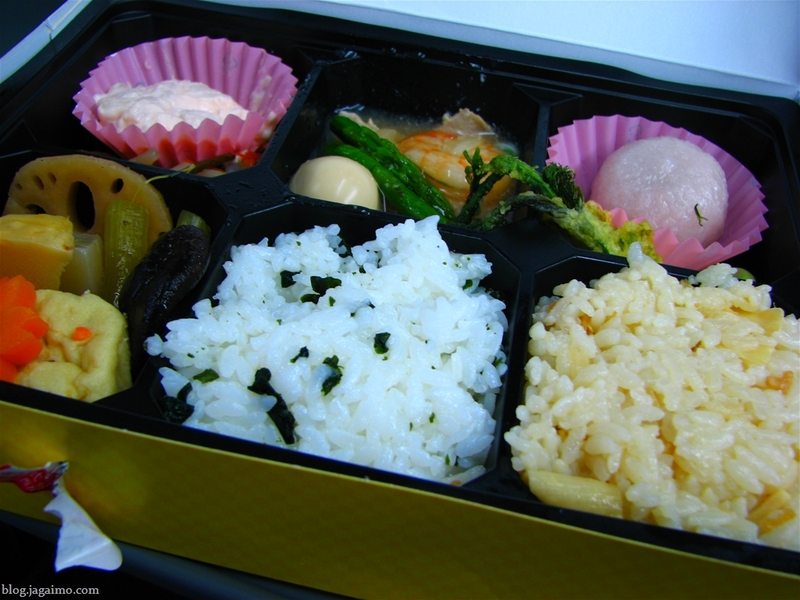 Lunch goes for JPY 2400-4000 ($22~40). 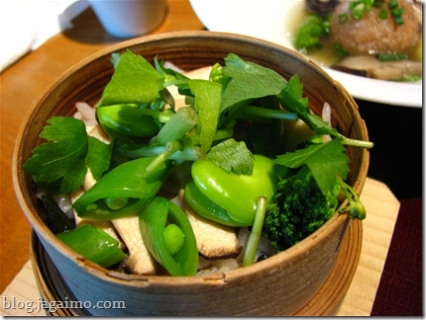 On this trip I've found that restaurants we've visited have been surprisingly accommodating for my vegetarian quirk. 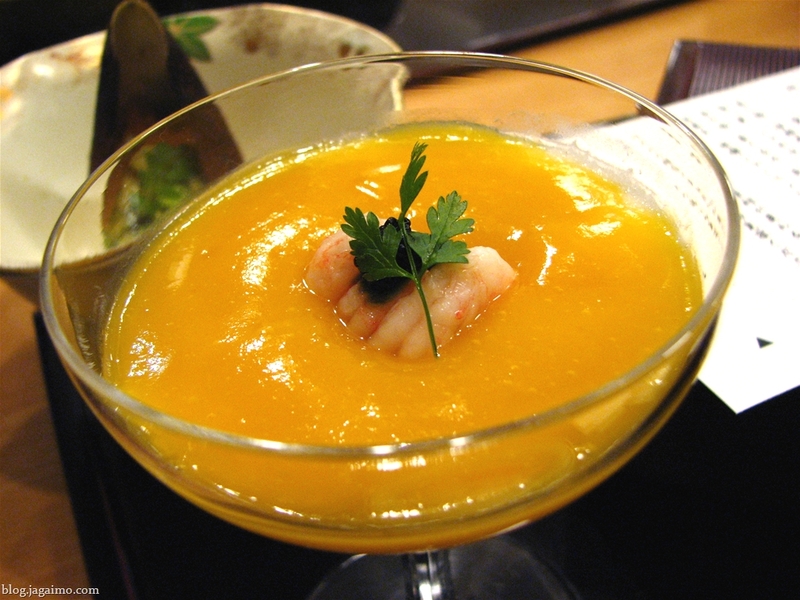 It's not customary in Japan to accept special requests (or, more importantly, to make them) at restaurants, so that hasn't always been the case. I don't know if it's because we tended to eat in fairly high-end spots, if we just happened to stumble on places with excellent service standards, or if things are gradually changing. Hiromi and Kristen ordered a special-of-the-day lunch, and one person ordered a simple curry set meal. 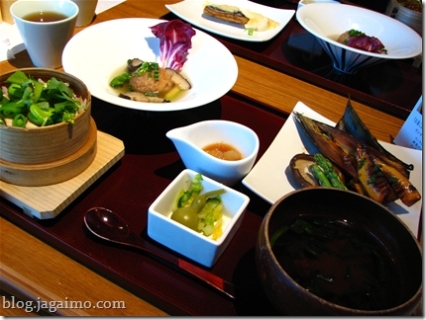 Grilled items weren't terribly prominent, but were featured in most of our meals. Five little vegetable-highlighting dishes... as usual, practicing a vegetarian diet in Japan requires a sense of humor and a tolerance for fish-as-garnish, as in the case of the typical katsuo-bushi (shaved bonito) dressed ohitashi (blanched vegetable dish, center) and the sakura-ebi (tiny shrimp) garnished sunomono (sweet vinegar dressed dish, left). 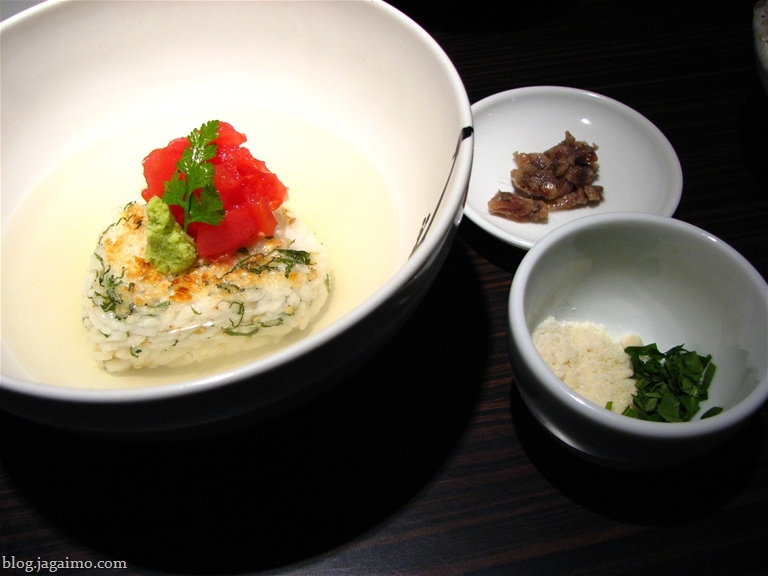 Our server noticed that one of the dishes in this starter course was made with crab, and without me asking, quickly swapped that dish out for an elegant and refreshing aloe ohitashi, which was meant for today's special lunchbox. A few years ago, aloe as a vegetable became all the rage throughout Asia, and this simple dish is reflective of that. 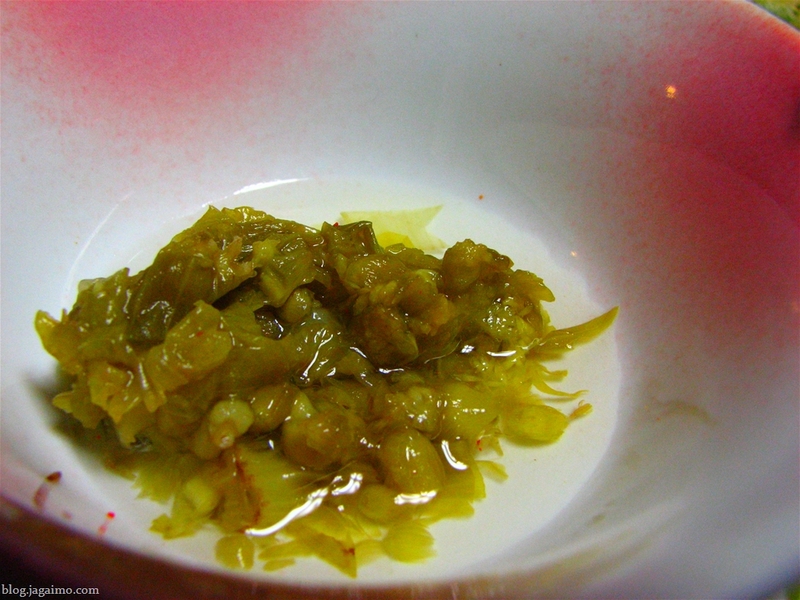 It's reminiscent of mozuku, thanks to the neba-neba (sticky) qualities of the aloe and the slightly acidic sauce. 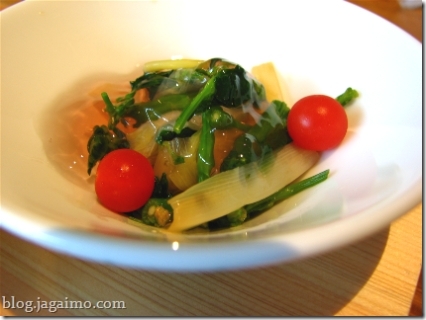 This ume-gelee dressed vegetable dish was surprisingly sappari. I guess I'm a sucker for Japanese apricot, but I was almost expecting this to be either strangely sweet or intensely sour; instead, it was well-balanced and full of pleasing contrasts. 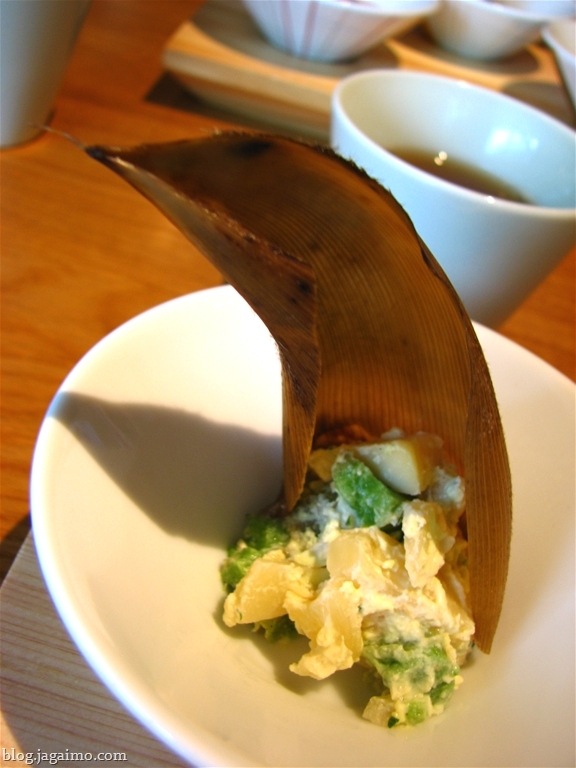 Potato and green bean salad in bamboo "bark"
This simple bamboo shoot and green bean aemono gets a dramatic treatment with a garnish from the outer layer of a bamboo shoot. One of Hiromi's friends ordered an elegant Japanese-style curry rice with an unusual presentation... the rice comes adorned with goya (bitter melon), takenoko (bamboo shoot) and other vegetables, and the curry itself is served in a gravy boat, which the guest uses to pours the hot curry over the rice herself... some pickles and another small side dish accompany this. I was too distracted to remember all of the things that come in the day's special two-tiered lunchbox, but the list was so long on the menu that I stopped reading carefully. 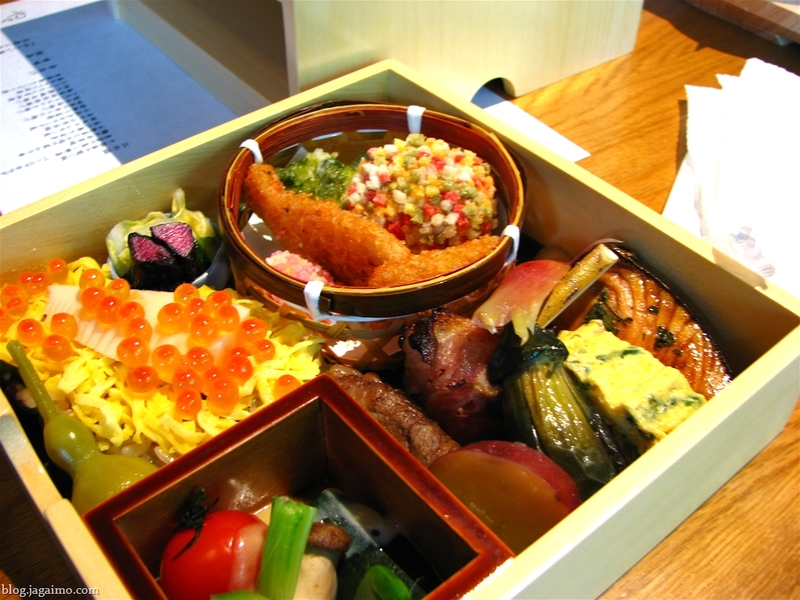 It includes some agemono (fried foods), a rice dish with ikura (seasoned salmon roe) and bamboo shoots, a few yakimono (grilled fish, vegetables and meat). 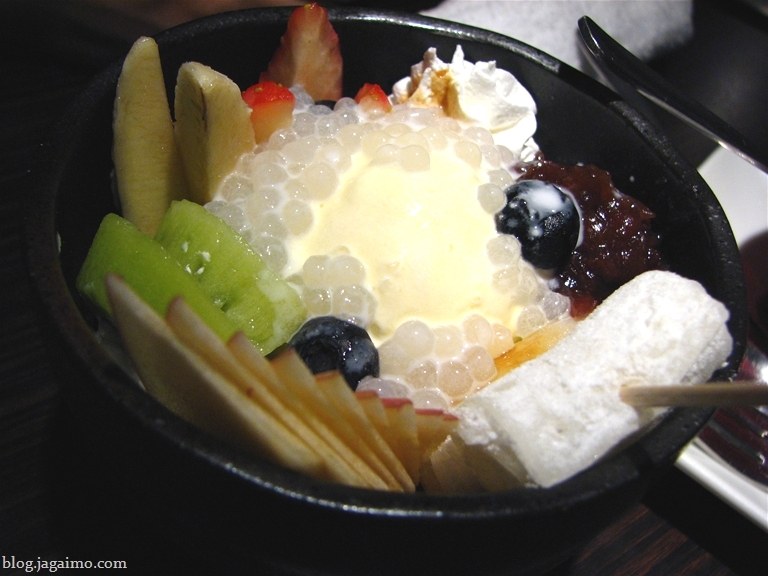 I think the confetti-puff-rice covered ball is a kind of meatball. The upper tier includes an aloe dish (as above), a kind of nagaimo pudding (I think), renkon (lotus root) chips, and a little maguro. 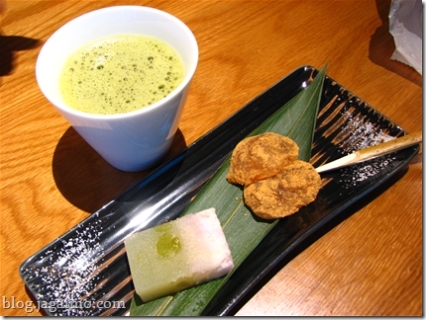 My order comes in two stages, and this second course features a rice dish, a grilled dish, a poached glutinous rice ball, and miso soup. Soramame (fava beens), maybe some nanohana (rapeseed greens), and some kind of ingen (green beans), along with some mushrooms and an herb garnish top my steamed rice. 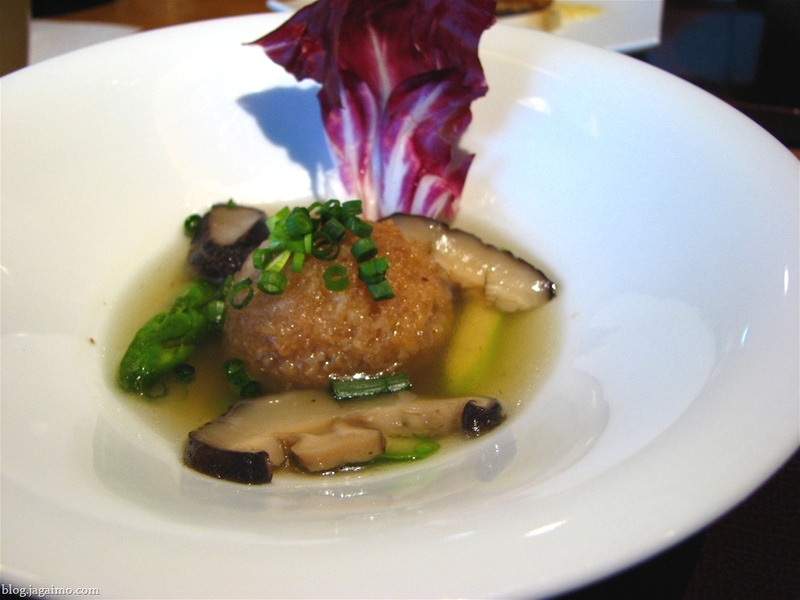 This glutinous rice ball is poached a bit in seasoned soup stock and served with shiitake slices. It was hard to resist. 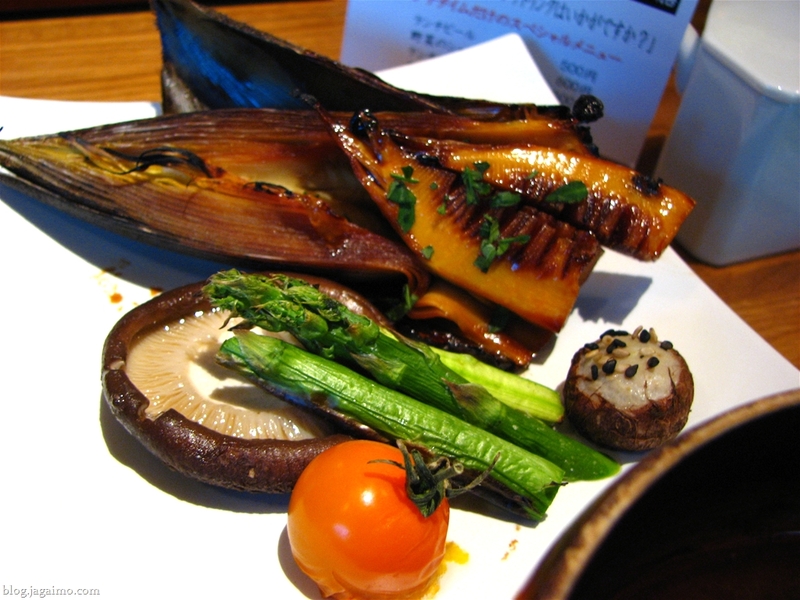 This was my set of robata-grilled dishes... the always-tempting spring takenoko, grilled bamboo shoots; grilled asparagus, shiitake, a cherry tomato, and a little nut that I'm forgetting the name of. 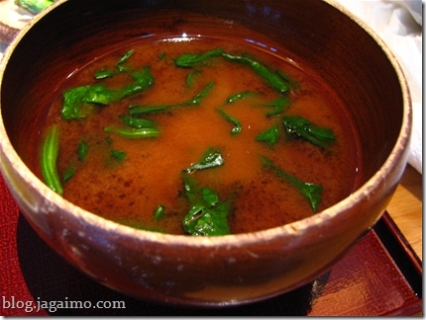 Spring greens in a strong miso soup. Most of us got this surprisingly tasty pickled hyōtan, or gourd. 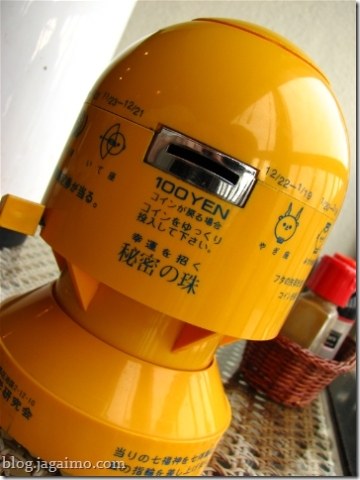 I can't recall actually eating hyoutan anywhere else before. I wouldn't hesitate to eat it again... I was surprised. 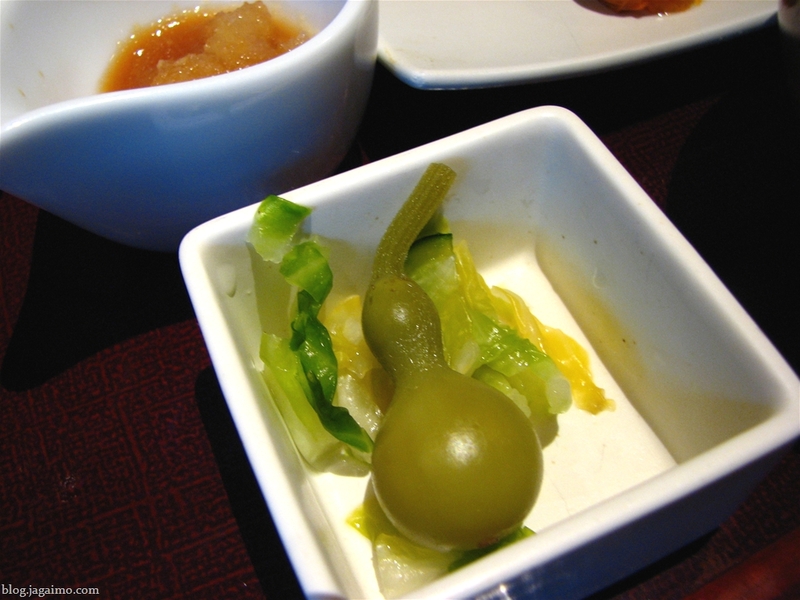 It was fairly ordinary, as pickles go, but I just haven't seen it before. To finish the meal, everyone received a little tea (low-end matcha), and two kinds of wagashi. 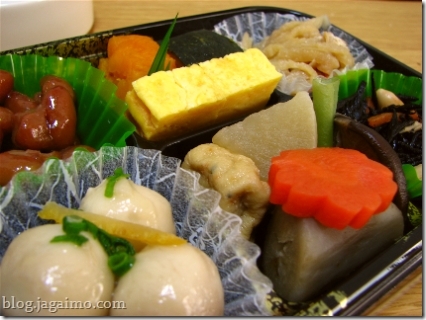 One is similar to warabi-mochi (right), and the other is a flavored rice cake. Working in a minimally-stocked kitchen that's completely different than your own is pretty tricky. 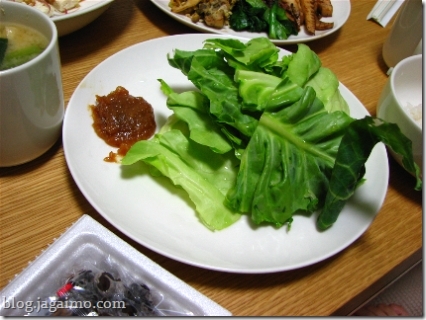 Our weekly apartment was equipped with a rice cooker, a saucepan and a frying pan. We had a few plates and bowls, but nothing close to what I'm used to at home. But after a bunch of elaborate, not to mention expensive, restaurant meals, we wanted to make something on our own. 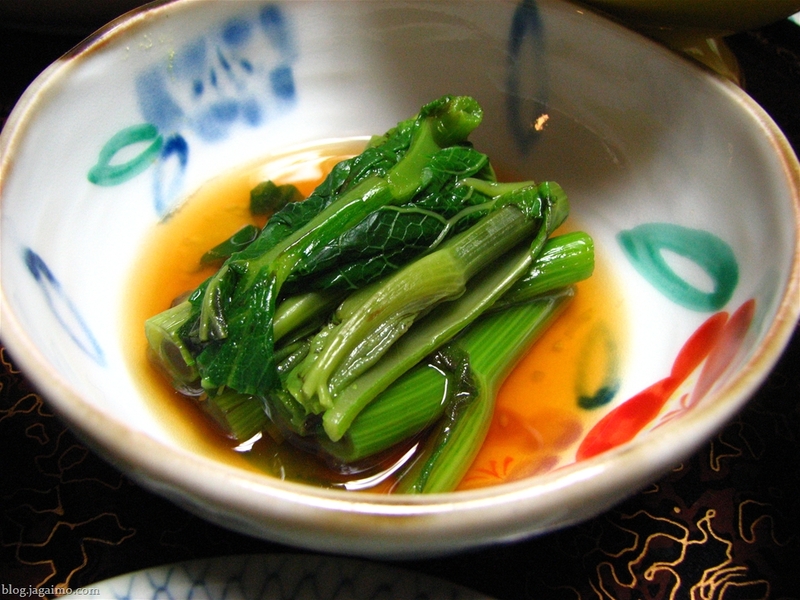 We have spring cabbage made with a quick homemade sweetened miso... this is sort of a typical izakaya dish nowadays. We soon discovered that the lighter colored leaves from inside the cabbage were much more tender, and decided to reserve the dark outer leaves for an itamemono on another day. We didn't really have all the fundamentals... just mirin, soy sauce, salt, pepper and instant dashi. 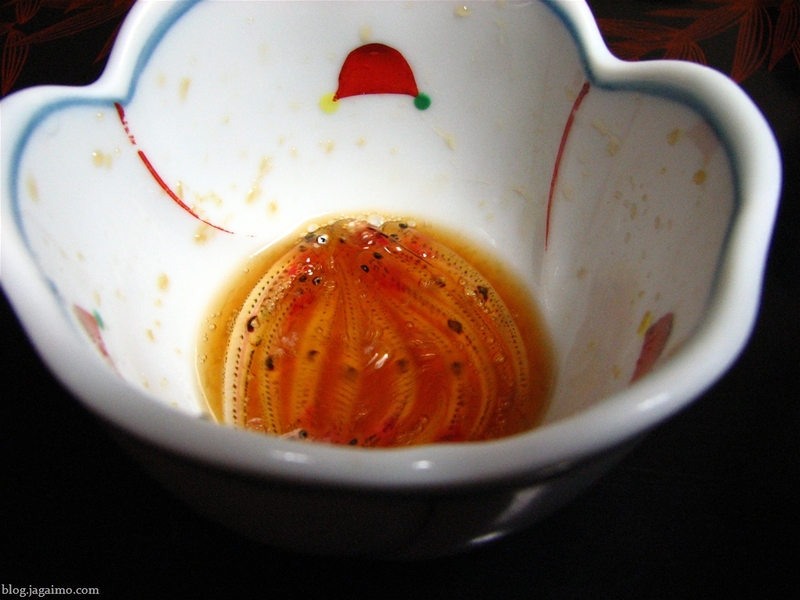 We had no vinegar, and we had only a small amount of miso. We didn't actually have any cooking oil; just some butter, meant for toast for breakfast. 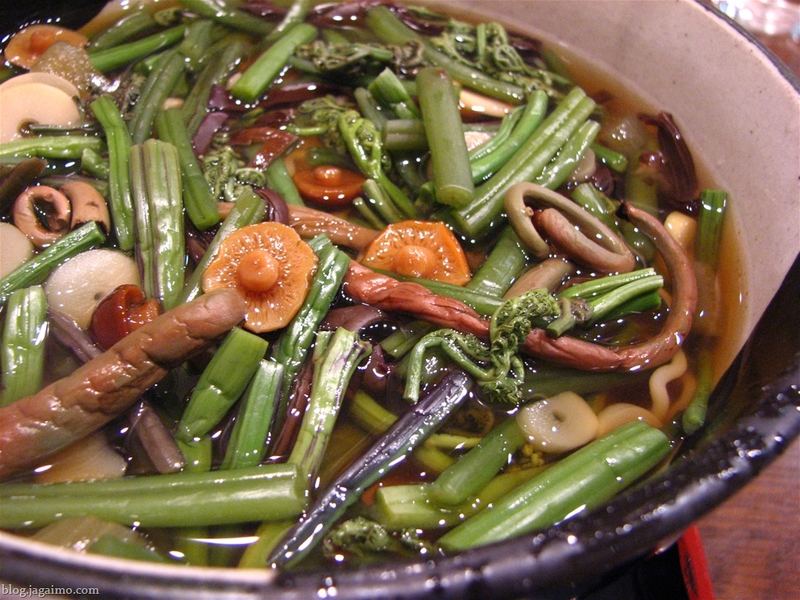 I normally don't use instant dashi since it's not vegetarian, but when I'm on the road and only cooking a few meals on my own, it's a bit harder to stock a bunch of konbu and dried mushrooms, so we relied a bit on a few granules of that dashi for a few things. 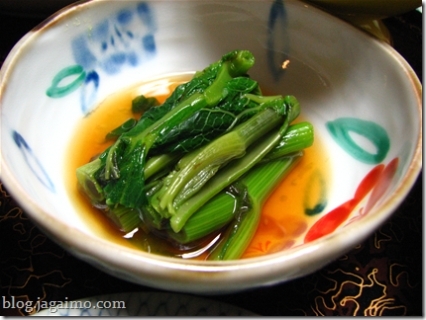 Although I'm not really a fan of the flavor of instant dashi, some dishes just don't taste right if you only use water. Since I already have to relax my vegetarian habits when eating out in Japan, I elected to make another small concession to reality, and I used small amounts of it in one or two dishes. 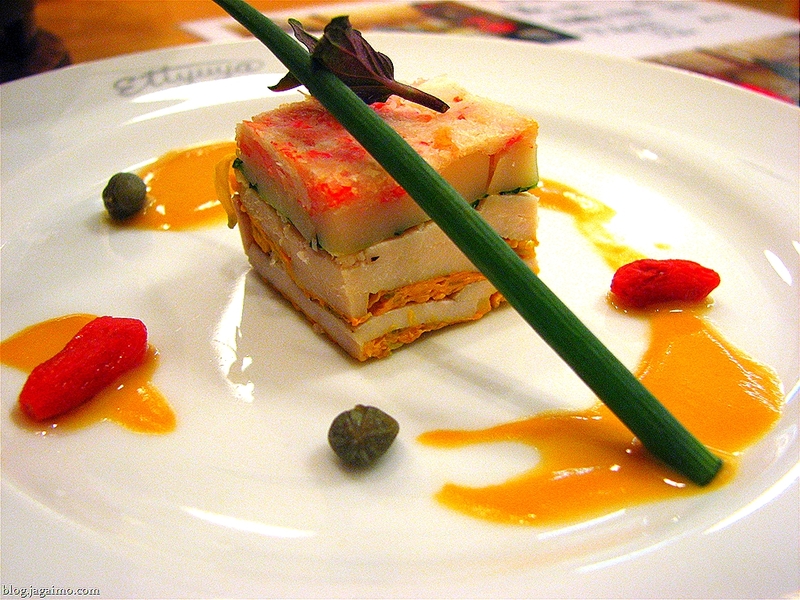 Since we only had a few plates, elegant platings had to be sacrificed, but we found some sort of solution. 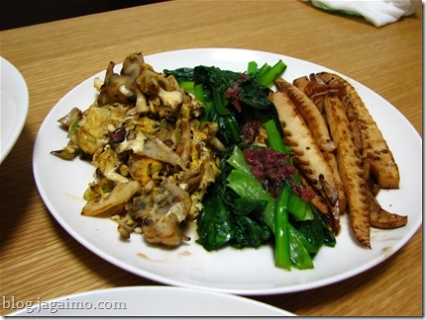 Our side dishes included, from left to right: An egg scramble with some cheap maitake mushrooms and leeks, an ohitashi made with sakura no shiozuke, or salted cherry blossoms, and grilled bamboo shoots with butter and soy sauce. They may not look like much, but everything turned out slightly better than I expected. 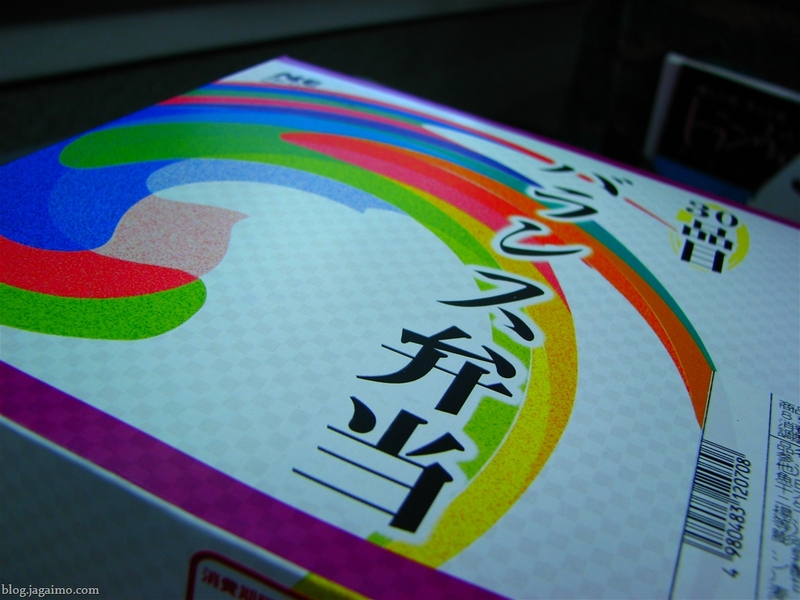 We love myouga, sometimes explained as ginger shoots in English, and it's hard to get in the US. Myōga looks a bit like the bulb of a shallot but has a gently spicy mild ginger flavor. I sliced some with the scary, flimsy knife supplied by our weekly apartment and scattered the slices inelegantly atop pieces of cut yuba, and carelessly drizzled some soy sauce over the yuba. 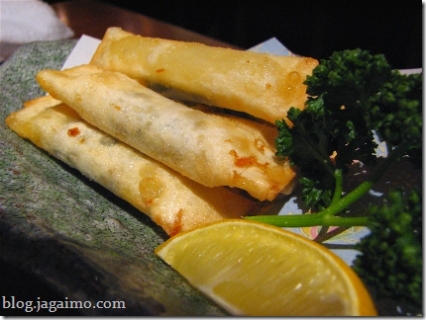 I miss fresh yuba when I'm in the US. 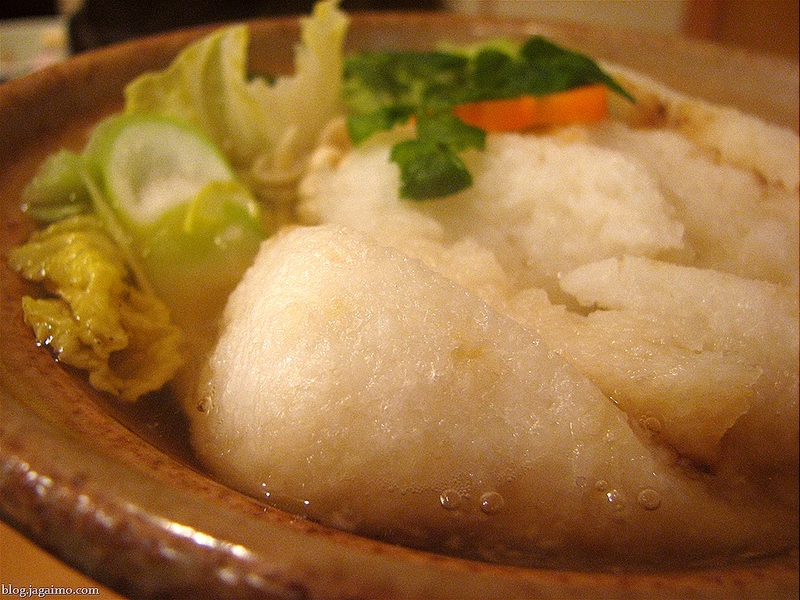 The best I can do is dried or, on rare occasions, previously-frozen... unless I'm willing to commit to sitting in front of a nabe for an hour or two as I slowly peel off pieces of yuba from simmering soymilk. I don't do that so often. 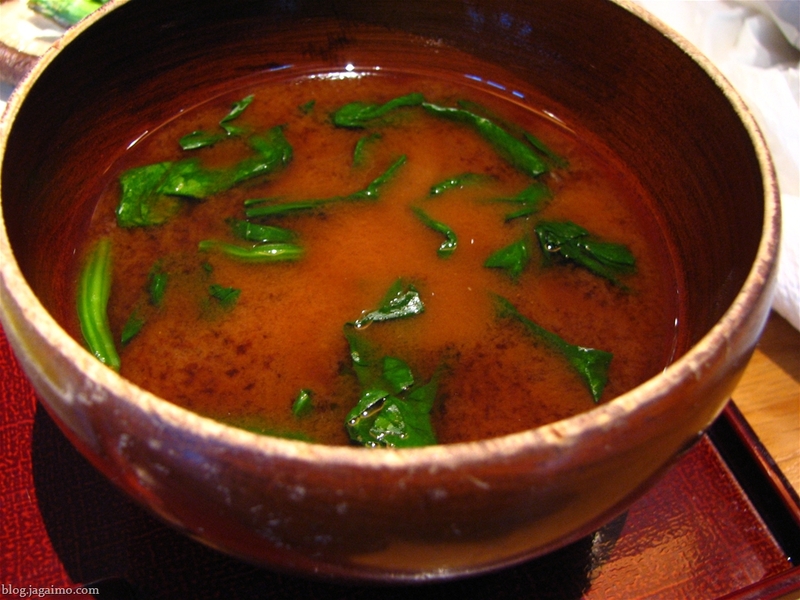 Hiromi prepared a miso soup, which I nearly ruined by adding too much instant dashi. 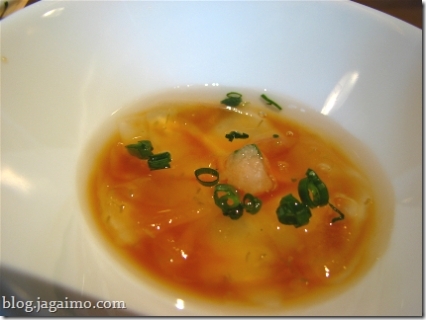 Since I never have any instant dashi at home, I didn't know how much is "normal" for soup. It turns out that the answer is very little. 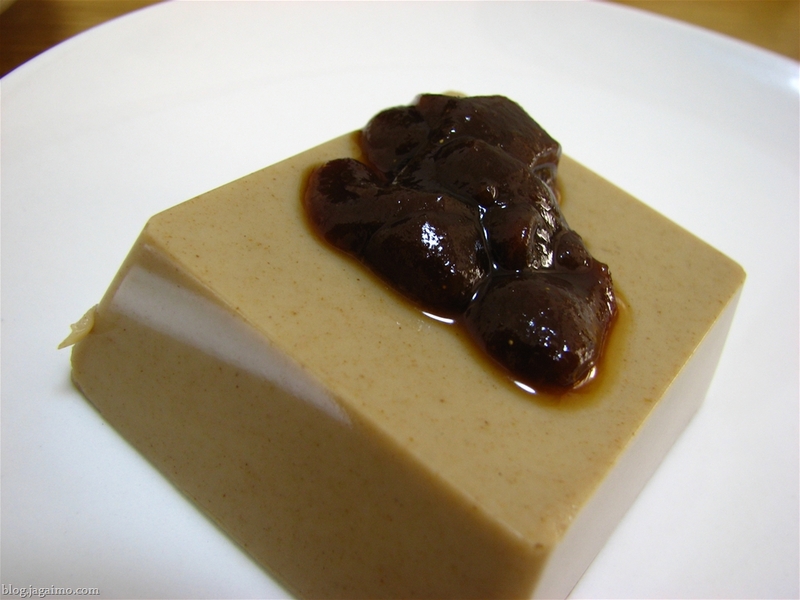 She also blended some more salted cherry blossoms into the rice to make sakura-gohan, and whipped out the kuromame nattou (black bean nattō) before I could blink. 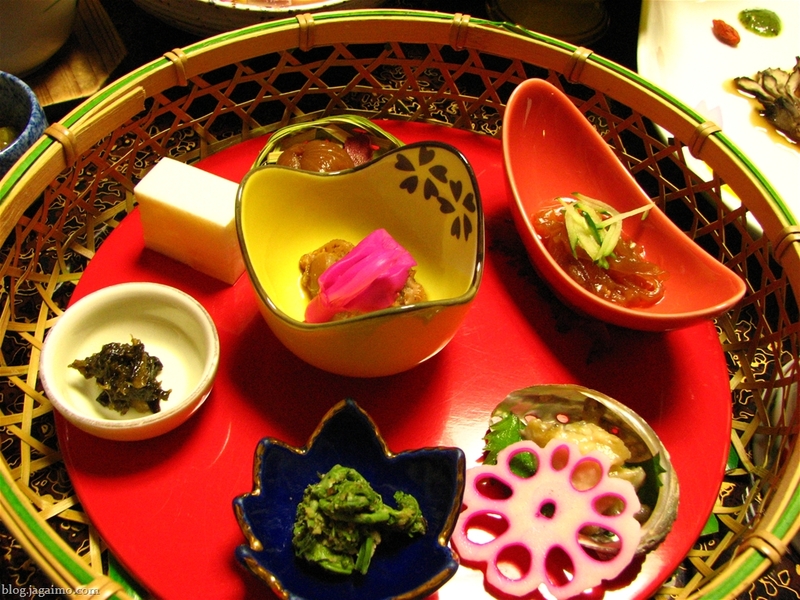 After a really fancy lunch in Omotesandō, this more humble dinner helped us balance our extravagance without feeling like much of a sacrifice. 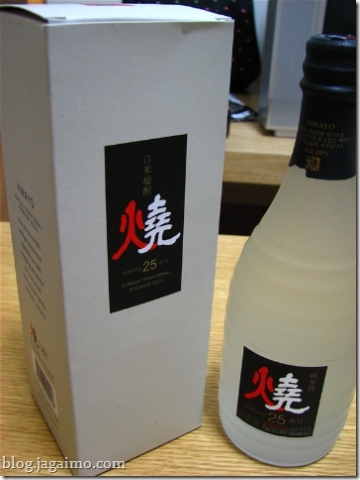 I had bought an "expensive" bottle of soju while in Korea at about KRW 11,000, or $11-12. The mass-produced stuff like Jinro and Chamiseul goes for less than $2 a bottle at your average convenience store, so this would be considered a bit extravagant. Anyway, tonight we cracked open this bottle and each had a glass of Korean shochu on the rocks with our dinner. 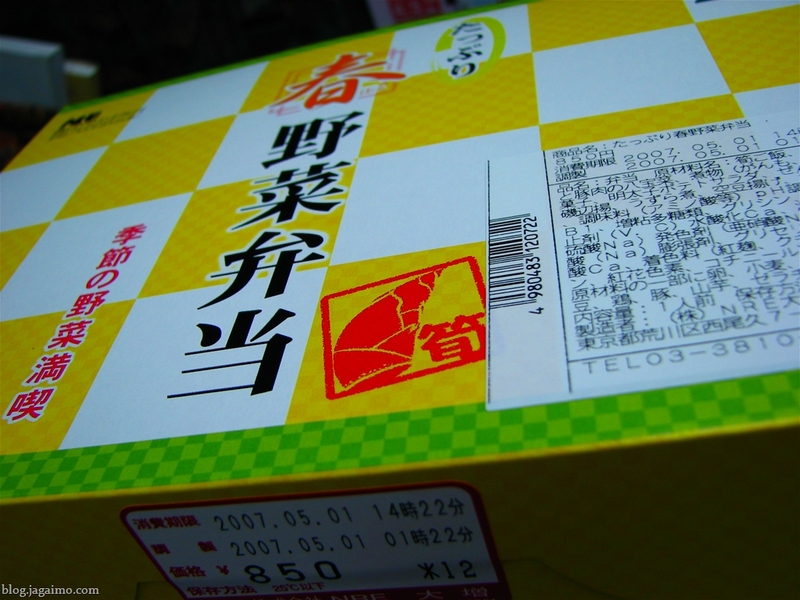 It's smoother and cleaner-tasting than the mass-produced brands, but not quite as nice as the better Japanese varieties of shochu. 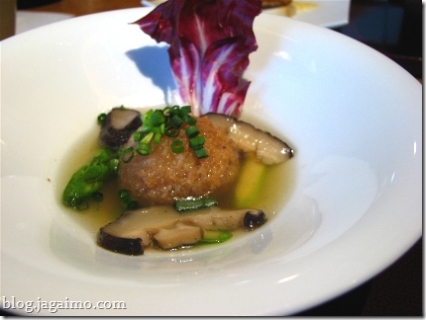 The flavor is relatively neutral but still has a hint of complexity. I'd buy it again if I were in Korea. Finding washoku in Hirosaki for lunch was actually suprisingly tough... the streets perpendicular to Hirosaki park were mostly full of meaty youshouku-ya-san and kissaten. 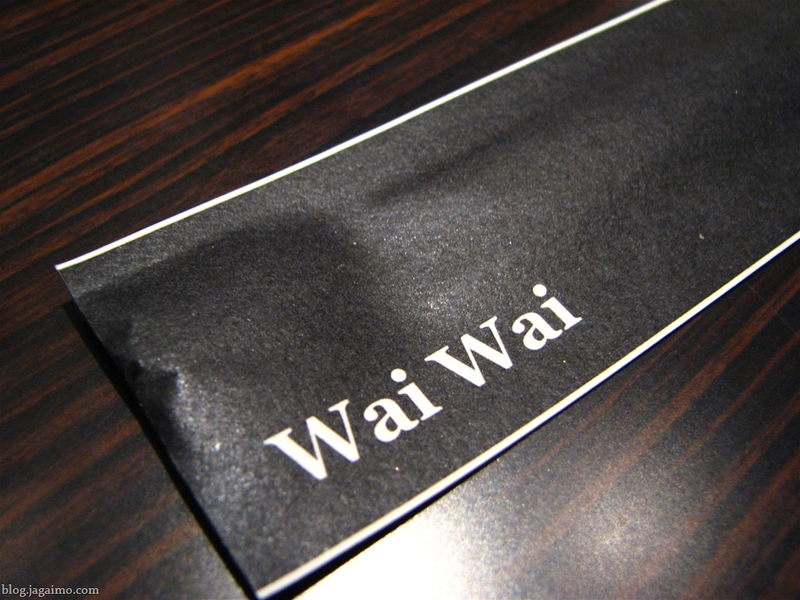 Finally we settled into an unremarkable department store restaurant floor, which had three choices. We both had some sort of soba dish. 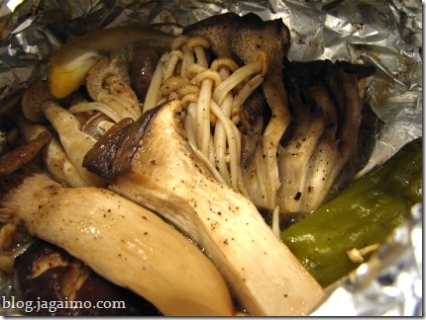 Mine was a sansai soba, or mountain vegetable topped soba. 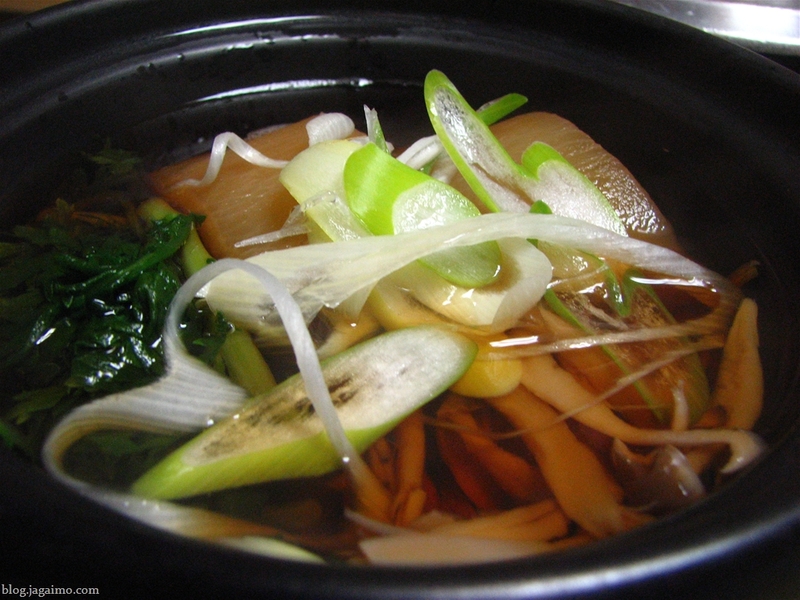 Usually sansai soba in Kanto is a slightly more elegant looking dish with just a few vegetables on top, but this place used a surprisingly generous amount of vegetables. It wasn't the nicest version of this dish I've ever seen. 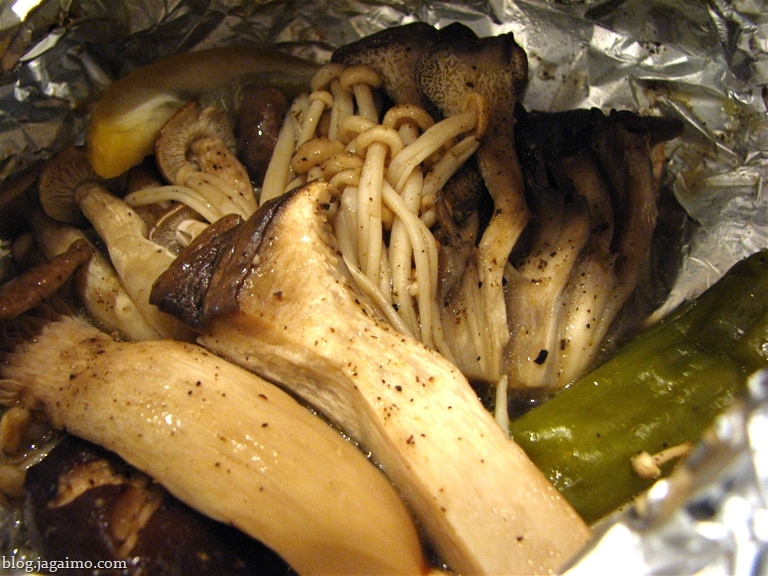 The vegetables probably came in foodservice packs and the soba was a little overcooked. But we were hungry and tired, and this was comforting and warm. Driven by sunnier weather, we had done our second day of hanami, but we didn't do enough snacking at yatai to feel full. So a couple of orders of noodles helped fill us up. 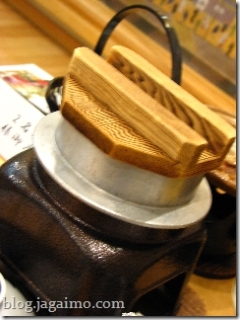 I also did a little bit of shopping, making my first serious investment in urushi. 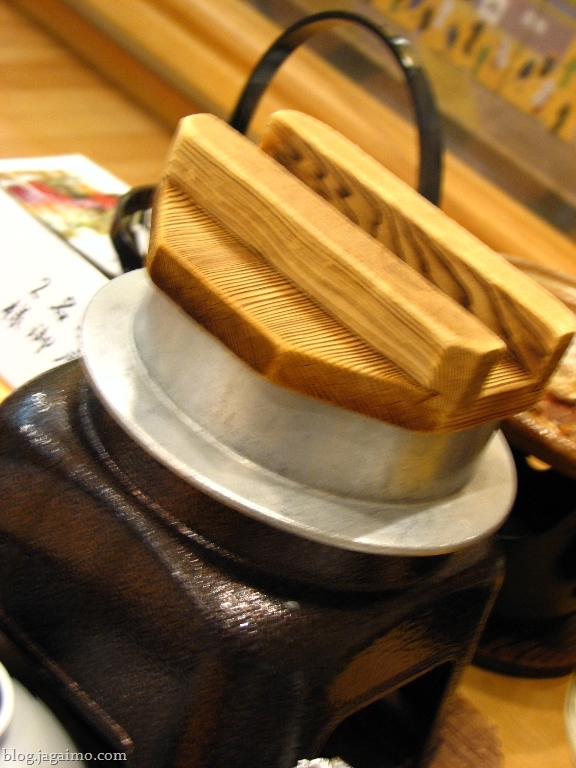 I really like nurimono, or lacquerware, but I've never really been brave enough to commit to anything beyond some cheap wooden misoshiru bowls and chopsticks. 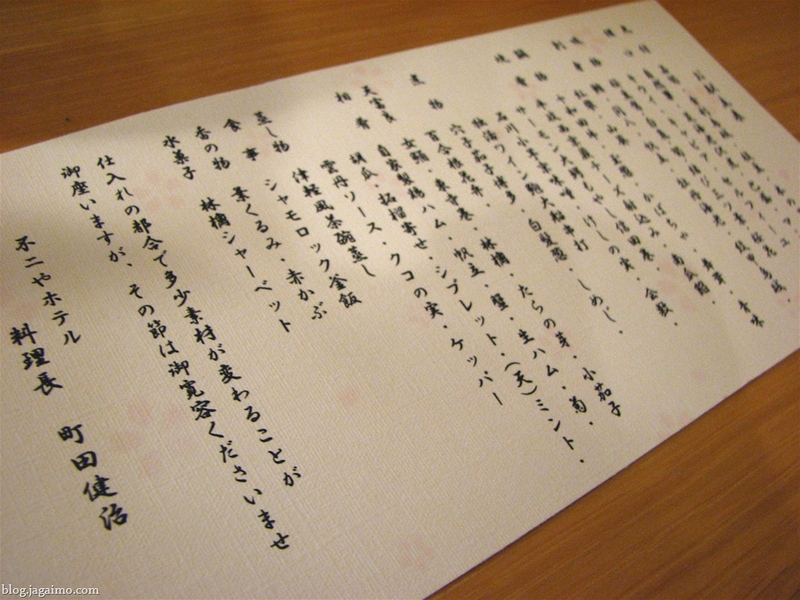 Aomori's style of urushi is very distinctive, and appeals to Hiromi's love for visual drama and my own quirky tastes. I actually have some older chopsticks from Aomori given to me many years ago by a friend, but I bought my first lacquer serving ware and two really nice sake cups... I promise they'll make an appearance on my blog in the future, but I didn't take any photos in the shop. 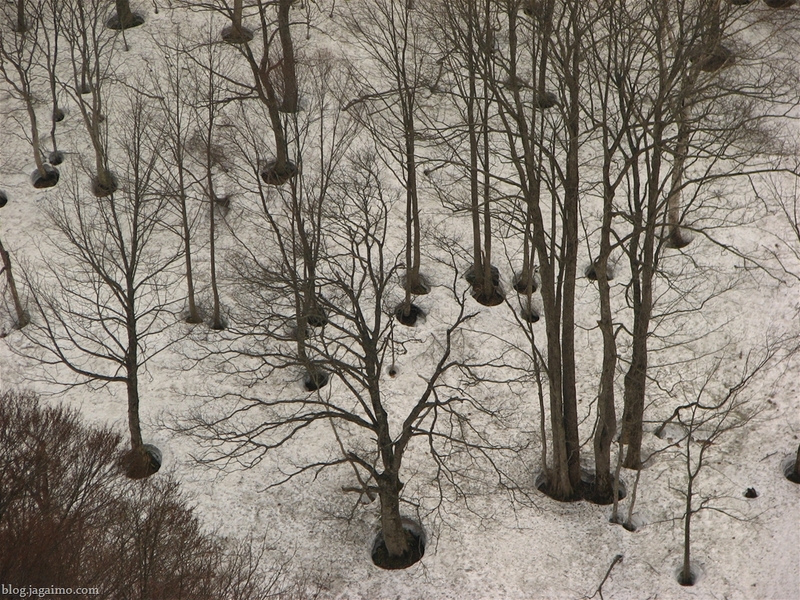 Somehow trees absorb just enough heat from the spring sun to help melt away small circles of the old snow. We made our way to a tough ski destination... you have to trek your own gear up the slope, as there are no mechanical lifts. 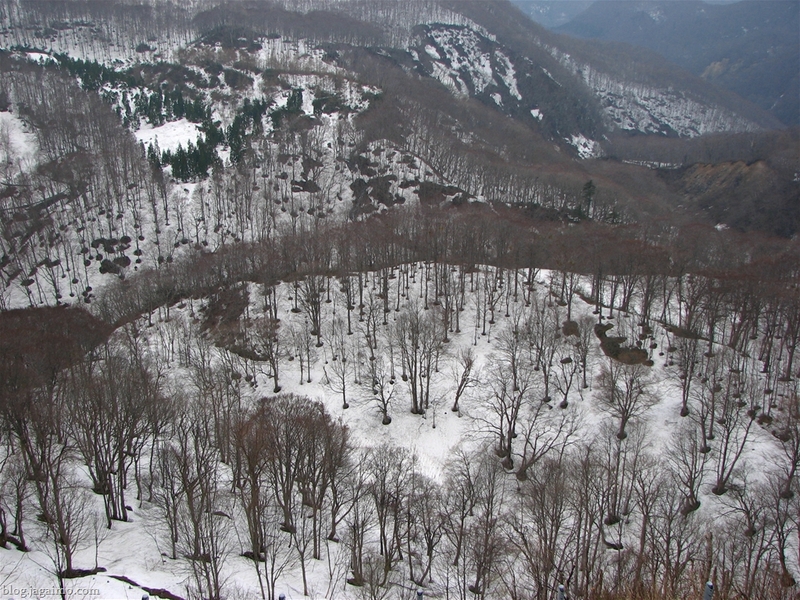 Our purpose for making this trek was to go to a hyakunin-buro, 100 person bath, with a highly sulfurous composition. 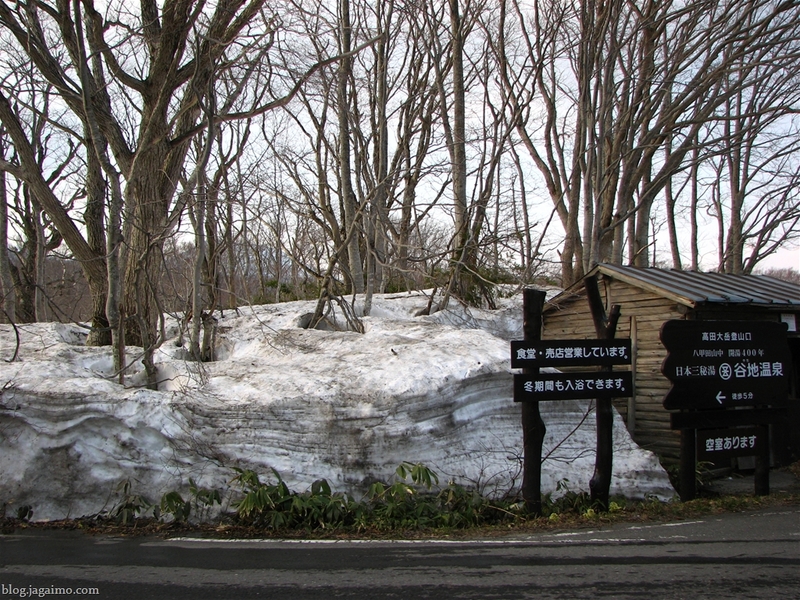 Unlike most onsen in Japan, this hot spring spot has only konyoku buro (gender mixed baths) and has been that way for a very long time. 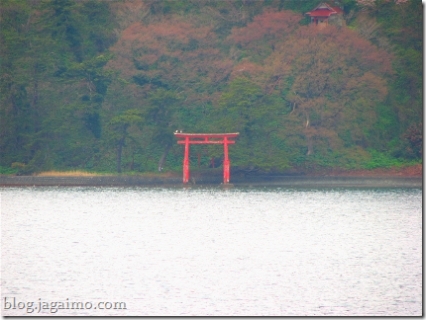 And unlike most konyoku buro I've been to in Japan, it was also very crowded. You just pay a a small fee for entry... I think about 600 yen per person ($5-6)... if you're smart, you will come with a couple of towels; we neglected this and had to buy some tiny ones. Hiromi scoped out the other women to decide whether she'd be brave enough to go with just the small towel as cover... After a demographic analysis, she caved in and bought this sort of bathing suit that loosely covers her body. Most of the women in their 20s or 30s, at least the ones without children, wore something similar; older women and women who came with children in tow concerned themselves less with such modesty, though most draped themselves with a large towel when entering or exiting the baths. The men, for the most part, used their small towels when moving in and out of the bathing area, and some covered themselves when outside of the baths. It's a strangely communal experience, but I think the experience was so unfamiliar to most contemporary Japanese that I'm sure most people were fairly self-conscious most of the time. In theory, the baths typically had a male and a female side, but the dividing line wasn't strictly enforced; I think it was just to give people some semblence of separation to create a small suggestion of privacy. 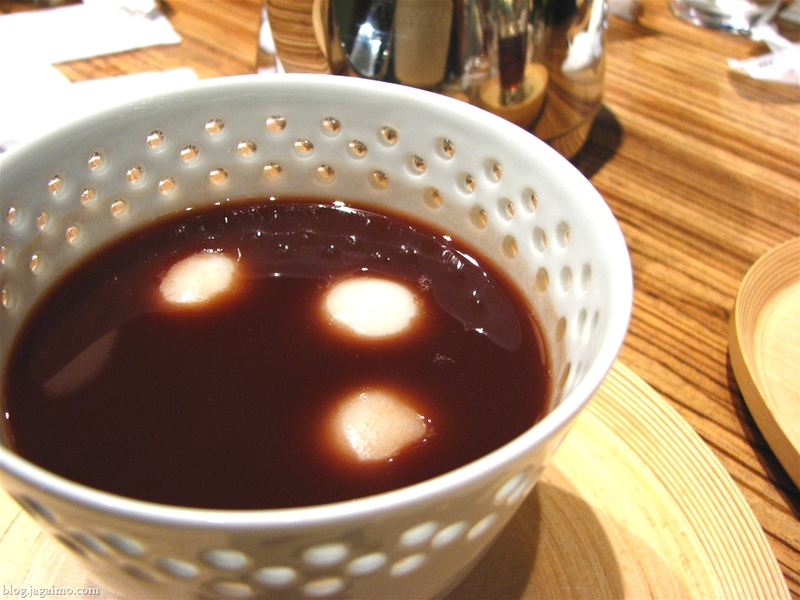 On our way out, we had some warm soba manjuu (buckwheat cake stuffed with sweet red bean paste) and some surprisingly decent sumibi-yaki coffee from the onsen gift shop. We started heading toward Hachinohe again, where we wanted to get a quick dinner in before taking the long train ride back to Tokyo. In the mountains, plows had dug through several meters of old snow, but the roads were clear... as we headed down toward the base of the mountain again, I snapped a couple of photos, though the snow wasn't nearly as high down below. 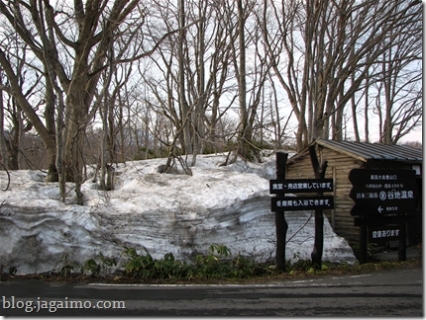 I was probably too sleepy to remember to take pictures up higher, where thick layers of old snow were piled up even higher. 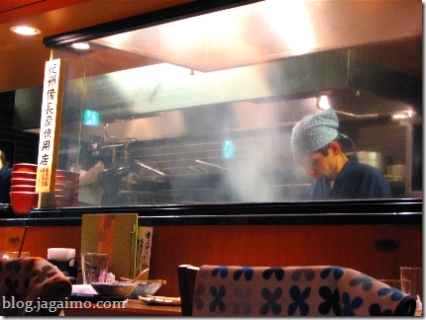 When we got back, we had a slightly rushed meal at a little train station robata-ya. I had packed away my camera in my luggage in the rental car, but we had a few memorable things... Hiromi had senbe-jiru, a soup made with puffed grain senbei and chicken, if I understood correctly; it's a regional specialty. I've kind of lost track of everything we ordered, but it was pleasing... I had a glass of a surprisingly whiskey-like aged shochu made with buckwheat. We also had some good tamago-yaki served like nigiri-zushi, grilled shiitake, and some really nice miso grilled yaki-onigiri. I'm such a sucker for charcoal grilled rice balls, because I can never get them quite right when making them at home on an electric appliance. Everything was shutting down early that night, including gas stations, but somehow we managed to refuel and return the rental car just in time to make our train back to Tokyo. 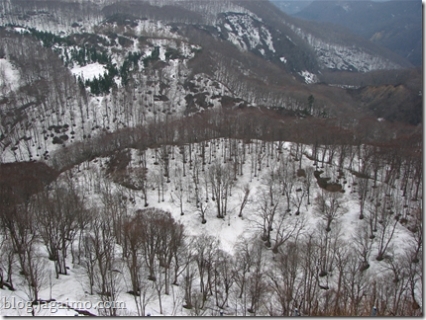 After our cherry blossom viewing, we retired to Oowani Onsen to rest a bit, with the overly ambitious intention of returning to Hirosaki for night time cherry blossom viewing. Fujiya Hotel has insanely roomy washitsu, or Japanese style rooms. The washitsu, which features tatami flooring, consists of a large dual-purpose room and a smaller one that might sleep a couple of children. But wait, there was more! For those who don't love Japanese-style bedding, or for particularly large parties, two twin beds are available in another chamber off the hallway. We felt like we could live there... it was probably slightly larger than the weekly apartment where we were staying in Tokyo, and that was one of the roomiest places I've ever rented in Tokyo. We chose to have a late dinner after a long bath. Both the men's and women's bath offer rotenburo, but the water wasn't especially warm, and it was more comfortable to bathe inside. They also had a sauna room, which I stepped into briefly before realizing I should have taken off my glasses first... 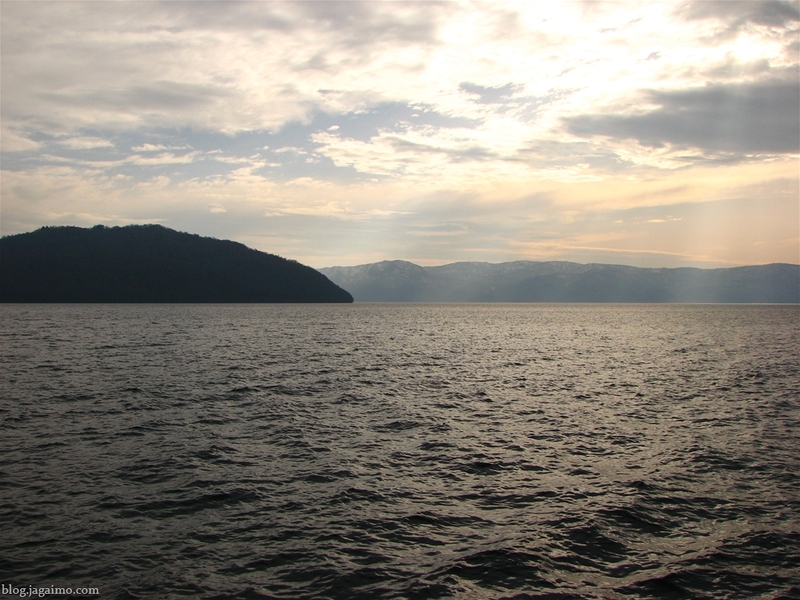 I popped into the cold water for a bit and started turning my attention to dinner. We ate in the hotel's dining room, which meant dinner was a little less intimate, but close to the kitchen, allowing for some surprisingly fresh, well-made food. 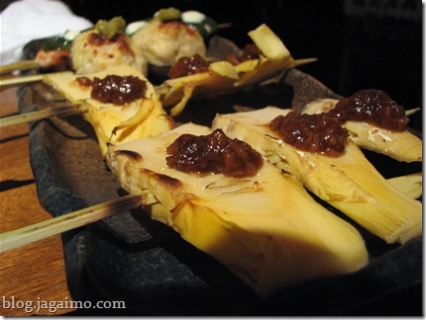 It's springtime, and I had a lot of fantastic grilled bamboo shoot dishes on this trip. But this was far and away the most visually dramatic, and one of the best tasting. 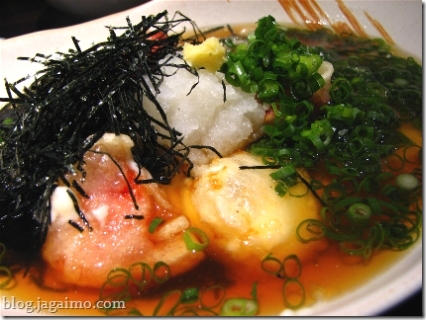 I think it's seasoned with little more than salt and soy sauce and perhaps a hint of butter. 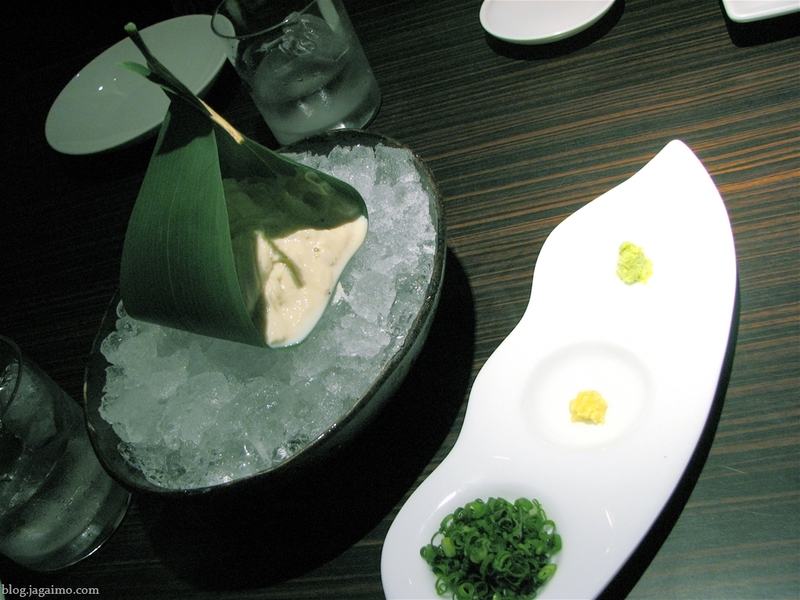 I really enjoyed it and will be longing for this simple, elegant dish until I can find my way to Japan in springtime again. 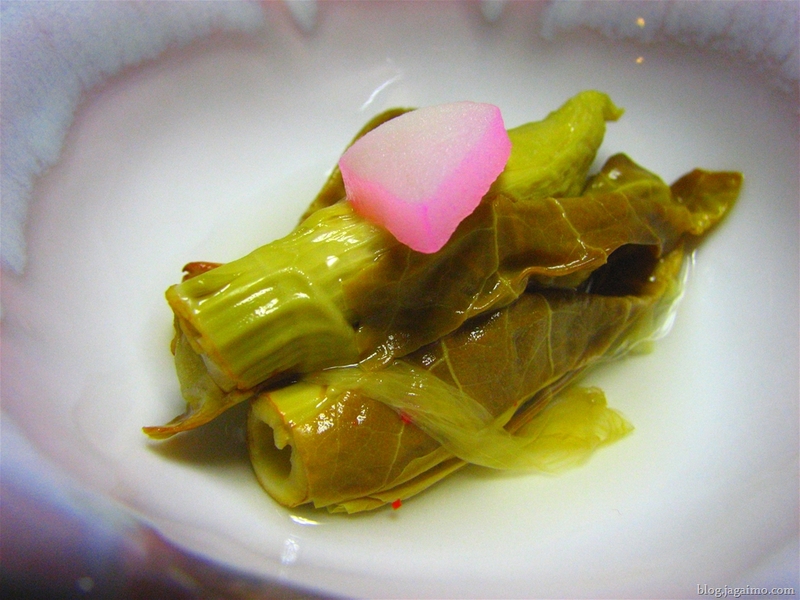 The bamboo sprout's skin also decorated a dish made with soramame (fava beans) and potatoes. 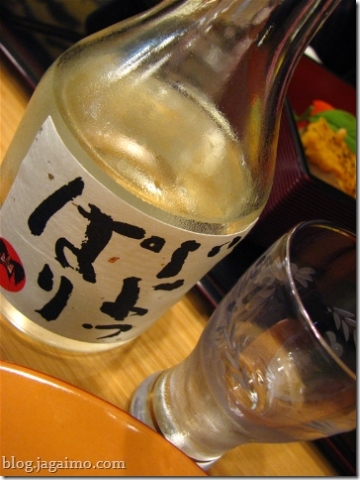 Apparently this sake's name, joppari, means stubborn, which fascinated Hiromi so much that she had to try it. 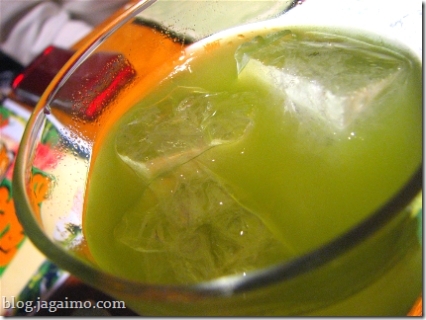 It also happens to have a pleasingly complex flavor, even as it drinks rather smoothly. 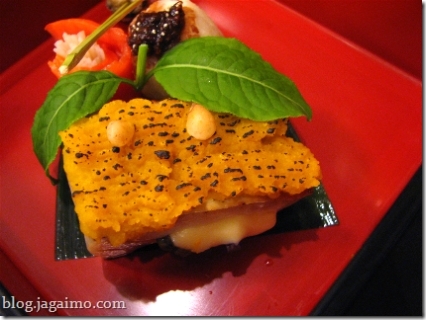 This fish-like fillet for Hiromi is actually kabocha atop ham and cheese, with a few pine nuts. I believe it was served with a grilled scallop and a carved vegetable. Blanched and dressed with gomadare, sesame sauce. More mountain vegetables, in a simple but pretty ohitashi. Another example of Aomori-ken's fascinnation with Western food, this salad featured mixed greens, cherry tomatoes, cheese, and a fairly intense vinaigrette. Hiromi's featured youshoku dish, featuring cooked and cured ham and mint, koku no mi (the red berry sometimes put on top of okayu) or capers. Hiromi also has a grilled wagyuu dish featuring local beef, cooked on a ceramic plate over a small flame. In place of the beef, I have another variation of that northern Japanese specialty, kiri-tampo. This is a simple kiritampo nabe, or hot pot dish. Since I can't have this in the US very easily, I'm pleased to have another chance to taste it. 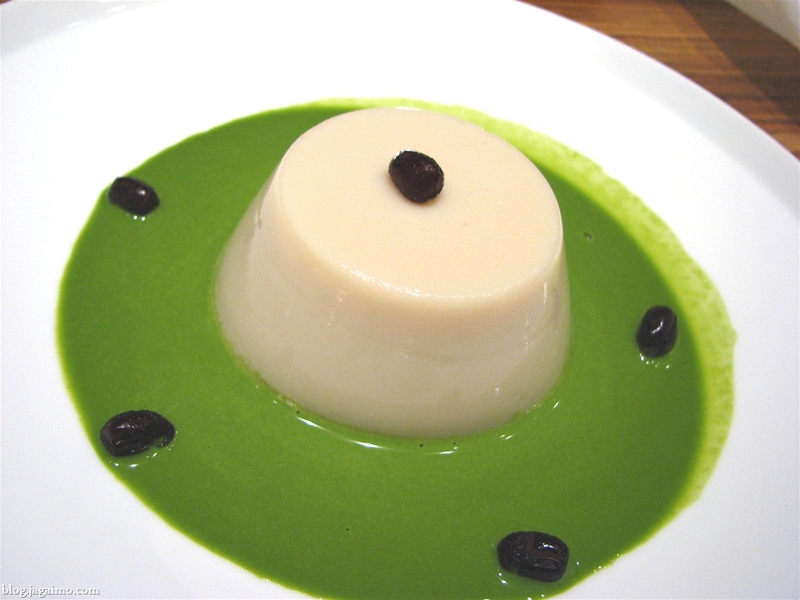 Oh, and a very nice chawan-mushi, or savory egg custard, arrived at just about the same time as this was ready... Alas, it didn't photograph very nicely, but I'm a sucker for a vegetarian interpretation for chawan-mushi. It seemed to take advantage of some seasonal vegetables as well. Ryokan tempura is often a little bit dreary, as it tends to be made quite far ahead of service... 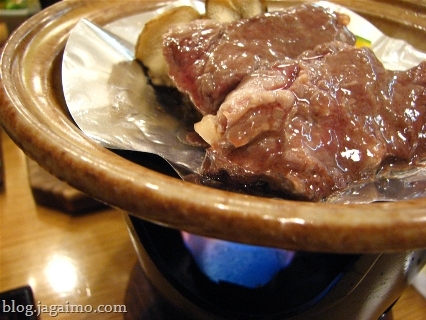 However, this one was served close to the end of our meal and was still mostly fairly warm. 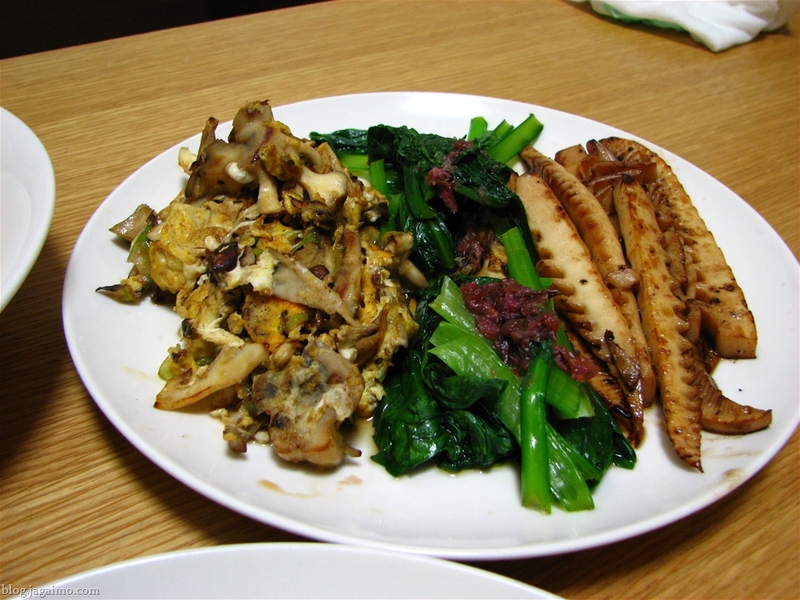 It featured tara no me (one of many Japanese mountain vegetables), fuki (butterbur) sprouts, shiitake, and, most interesting of all, a slice of apple. I've had heavy American fast-food fried apples before, and I have to admit having a soft spot for them, but this was surprising. 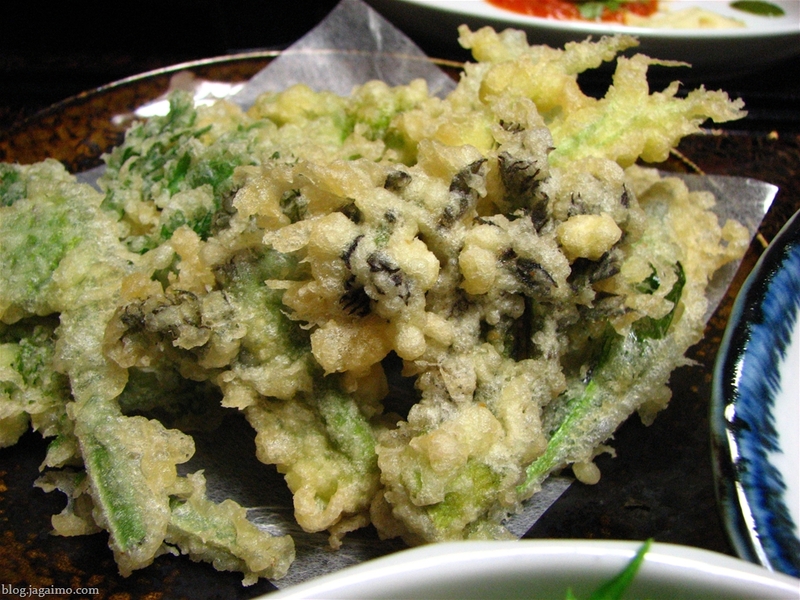 The fruit was unprocessed, and fried just a short time, so it remained crisp and gently tart, and had the same light crispness that the rest of the tempura featured. 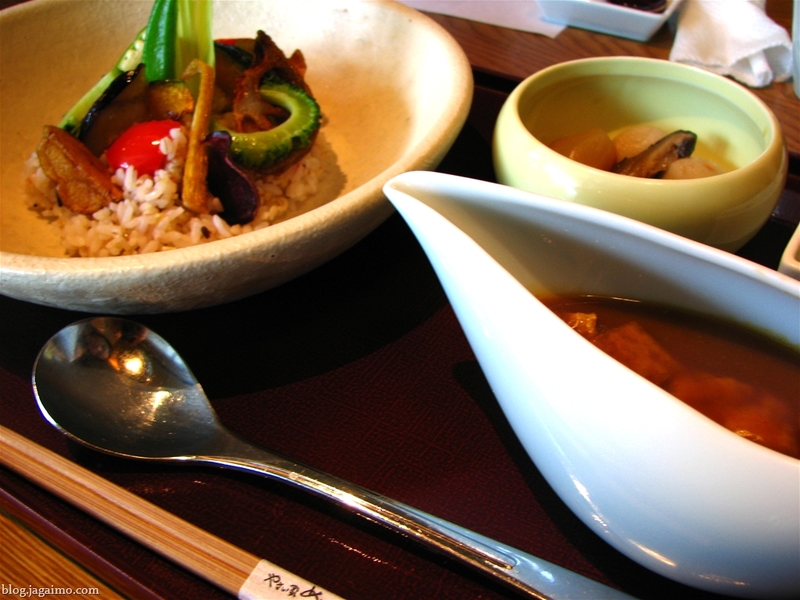 Rice is cooked at our table... Hiromi's is a seasoned kamameshi with bamboo shoots and I think some pork. Mine was plain, but rice cooked in this kind of pot always tastes better. We also receive a simple clear soup with thin slices of mushrooms and salt-cured cherry blossoms. 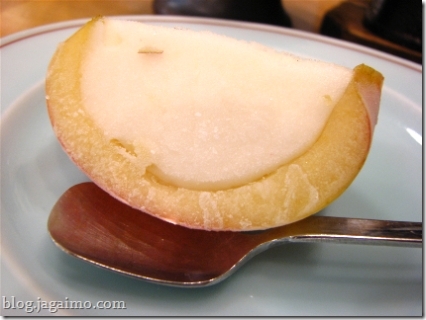 This was a very good apple sorbet inside an apple shell... 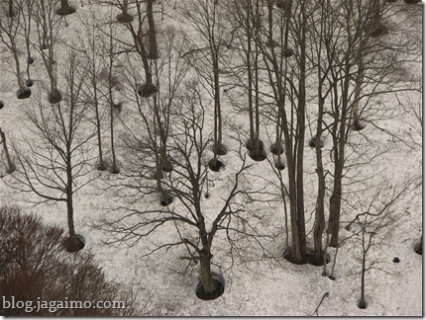 It's Aomori, after all, and apples are a big deal here. Before dinner, Hiromi had thought we'd go back to Hirosaki, but I think we fell asleep no later than 9 pm. We somehow woke up again, but it was already approaching midnight... too late to seriously consider the 25 minute trip back to Hirosaki Park, but not too late to head to the outdoor ceramic onsen tub on the same floor as our room. 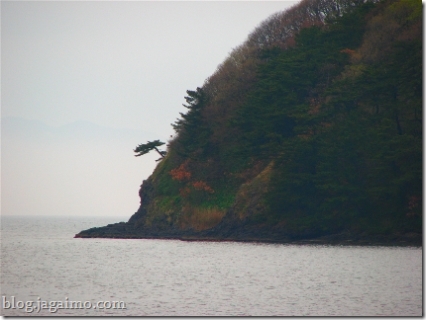 A big rock, a little island, just across the bay. A view of the left side of the island reveals a dramatic-looking pine. 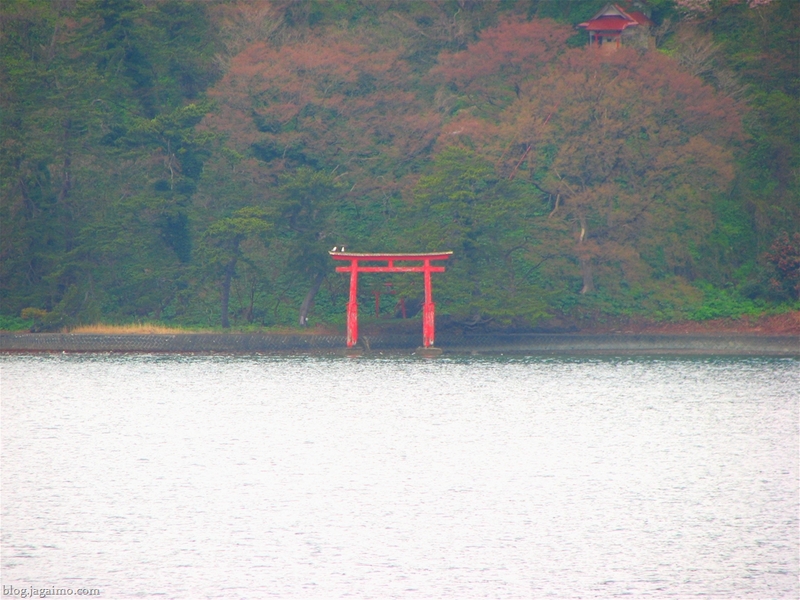 There's a gate and a long stairway to a temple starting at the waterfront. 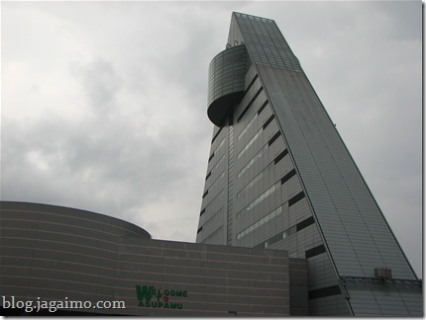 We made our way toward Aomori city, and discovered this odd looking building called Asupamu, to which Hiromi made a beeline in our rental car. It turns out that it did its job very well: the ground floor is full of gift shops peddling various Aomori specialties, and an impressive observation deck about 13 floors up. (We didn't feel any need to spend 600 yen each for that, even after buying so much stuff that we were good for up to two hours of free parking). We gave in and bought a lot of them, some of them destined to be our gomen nasai present for coworkers when we return to the office, and some treats for friends, family, teammates, and fellow Meetup members. Oh, and some "gifts" for purely self-indulgent purposes. We need those. Self-indulgence is good. 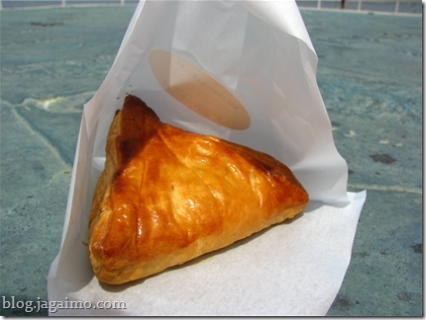 After sampling the delights of the many Asupamu gift shops, we had pie from an Asupamu apple shop. We like pie. This one has some cream cheese in it. 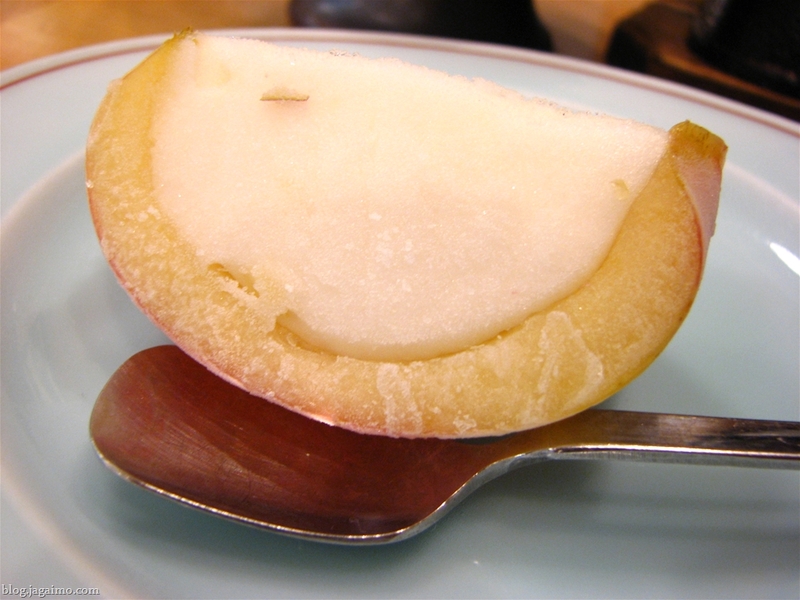 Aomori is famous for apples, so that makes this local food. 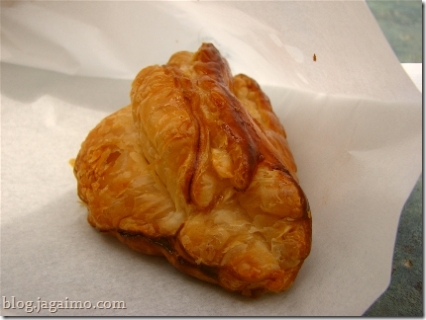 I chose this chausson (lady slipper?) for myself, but Hiromi thought it was boring compared to two of the other nifty options and I could sense her disappointment. Until she proceeded to eat at least half of mine. (I got my fair share of the cream cheese one though... I'm just making fun of her for visibly, if quietly, doubting my judgment). Of course, no coastal tourist shop would be complete without some sort of rotating squidmobile. 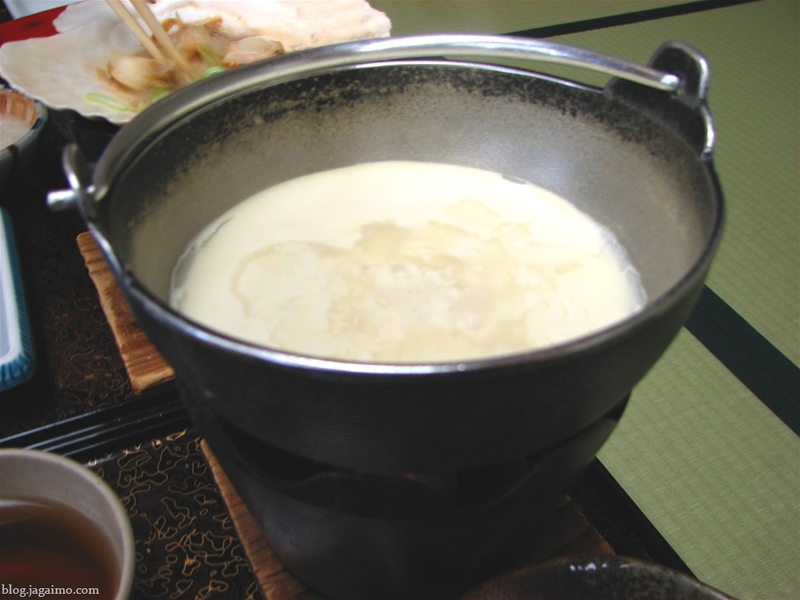 So my low-protein dinner transitioned into the extreme opposite in the morning... not only did everyone have a pot of tofu, made right at the table in bunrai nabe style, but we also had this surprisingly nice egg dish. Where's the egg, you ask? Well, it's on the side. There's a little negi, soup stock, and miso, and we mix the egg in using waribashi... 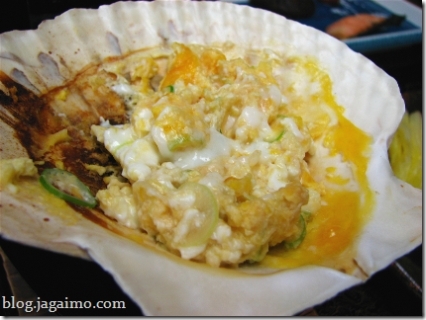 Within a couple of minutes, the flame underneath the seashell cooks up the egg. Hiromi's version of the egg dish also featured some dried scallops. Fresh and creamy tofu, served with a little negi and shouyu for dipping. Of course there's a fair assortment of tsukemono (pickled vegetables), some yamaimo, a little hijiki... a very complete, very substantial breakfast. Our breakfast is served with a little houjicha, roasted green tea, which somehow seemed a very homey way to start the day. 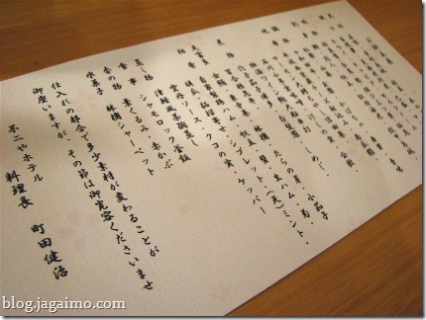 We stayed at an onsen ryokan (hot springs resort) called Asamushi in Aomori city. 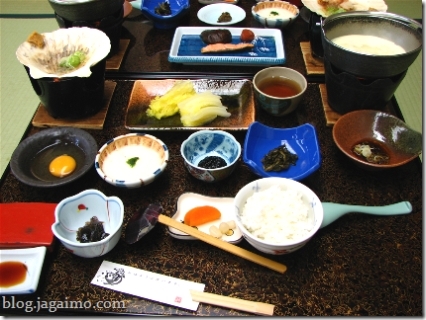 Most Japanese ryokan, given sufficient advance warning, are reasonably accommodating of vegetarian needs, though they don't always quite understand them. Usually things work out, with occasional use of non-vegetarian soup stock or a garnish of katsuobushi. 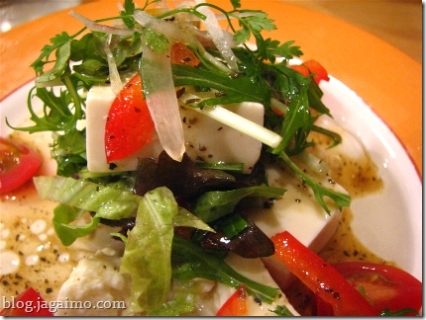 In some cases, the food ends up being a bit ascetic. Ryokan also tend to veer toward the fairly esoteric, so some of these dishes I've never seen before. I was mostly happy with the taste of the food at our first ryokan this trip, but the meal ended up being surprisingly devoid of protein... usually there's at least a bit of tofu or some egg dish, or sometimes some yuba. This time, though, there wasn't even a hint of that. Even my nabe dish was little more than a suimono, though I think Hiromi's had a little tofu. The actual dishes were actually quite nice, but I felt a bit low in energy after the meal, which rarely happens when I eat at ryokan. 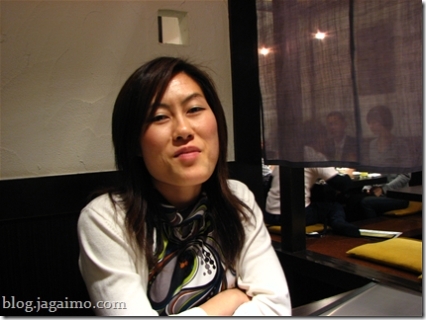 Hiromi's had a bit more seafood, of course. 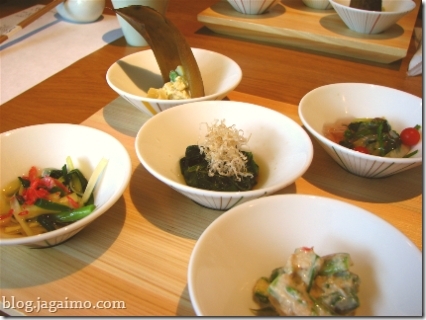 These were some of Hiromi's side dishes. 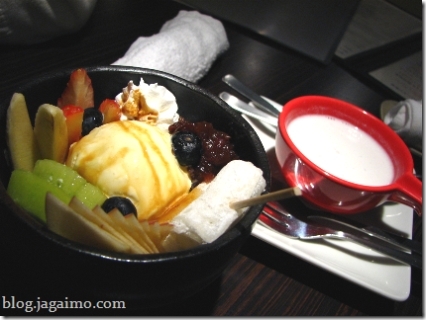 Apparently Aomori has a fondness for youshoku, or Western food, as we discovered later in Hirosaki. 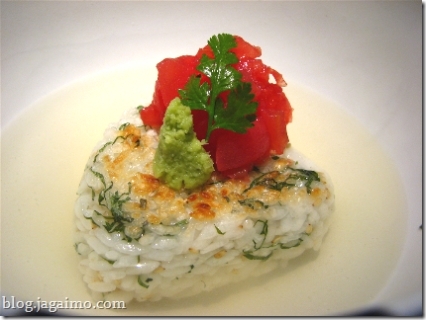 I think this presentation, offered to Hiromi, was meant to be a kind of cute deconstructed pasta dish. 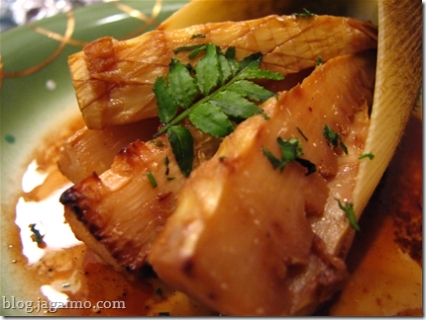 My version had some grilled bamboo shoots with a miso sauce. 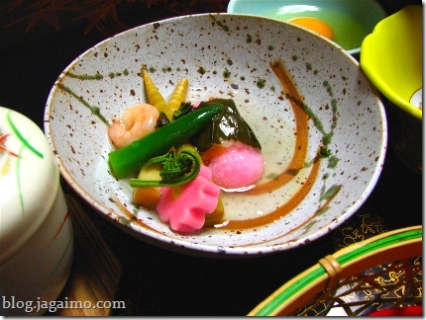 One of Hiromi's dishes, this features fu (the cute cherry blossom shaped wheat gluten item), kagomi, shrimp, and takenoko (bamboo shoots). 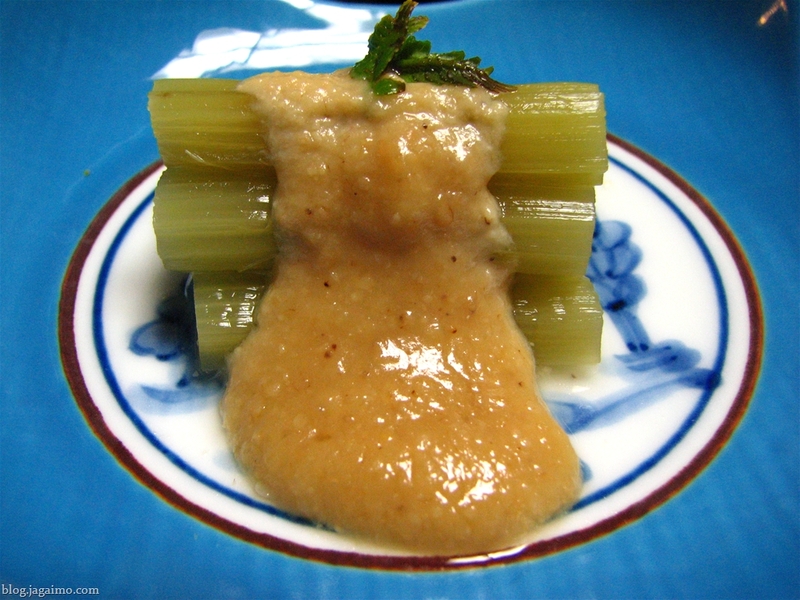 Itadouri, Japanese rhubarb or knotweed, one of many spring sansai (mountain vegetables). While not technically rhubarb, it has a slightly acidic bite to it. When lightly dressed, it's slightly vegetal and gently bitter. 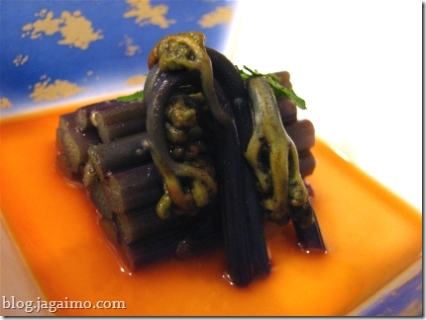 Fuki no tou, the sprouts of butterbur. This is particularly common in spring in northern Japan, but it's also found, and eaten, frequently in other parts of Japan. A simple dish of blanched greens. 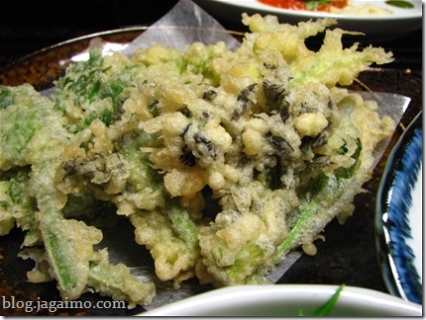 I always seem to end up with tempura at ryokan... even if they aren't serving it to everyone else... 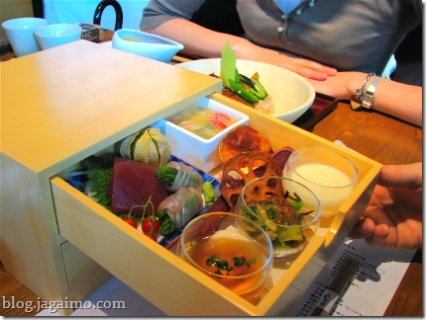 It seems to be a typical substitution for a sashimi course. 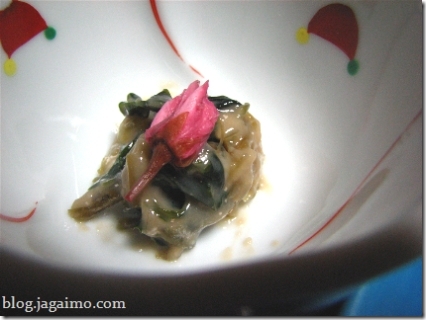 This one features some mountain vegetables, mostly kagomi. A light clear soup with daikon and negi. 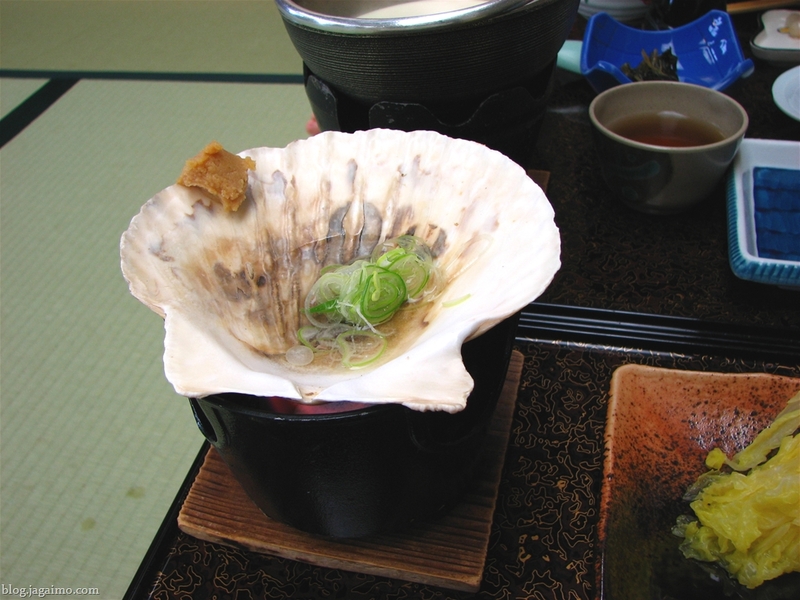 As a special treat for Hiromi, the ryokan brought a small dish to our room featuring these nama-shirasu, which were still alive and kicking. 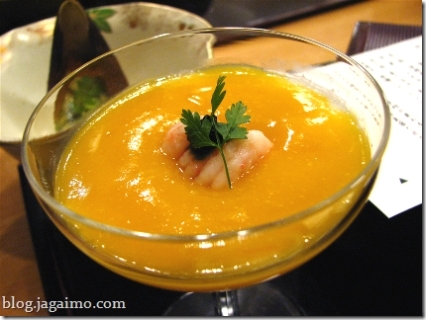 I've seen Hiromi refuse to taste something only twice. The first was bundaeggi, and she pretty much says all bugs are off limits. The second was this. I'm not sure the taste or aroma would be terribly shocking, but it seemed just a bit too disturbing for her. Actually, strangely, I think it bothers me less than it does her... and I don't eat any fish... Though I guess the point is moot. 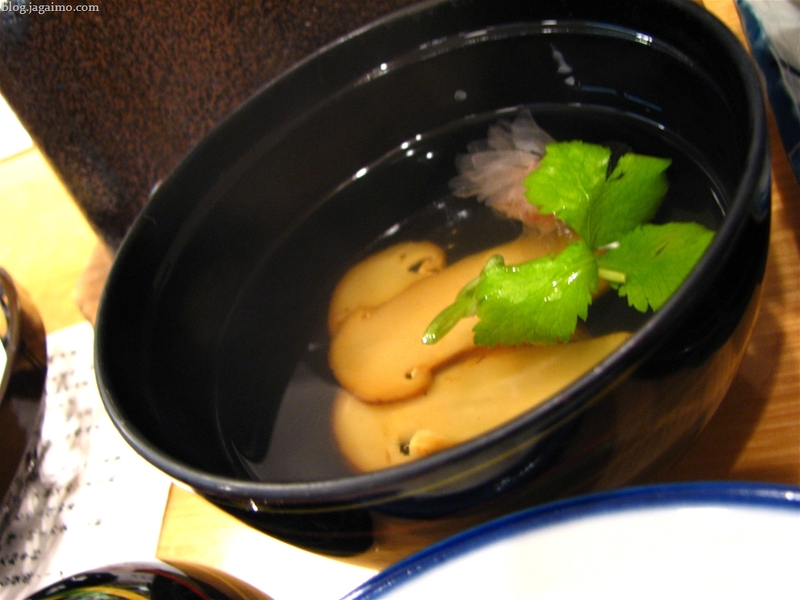 Note the splashes of soy sauce along the side of the bowl are the work of the fish, not of sloppy plating. After dinner, I ate some kurogoma ice cream to get at least a little hint of protein, and Hiromi ate a really nice apple sorbet. 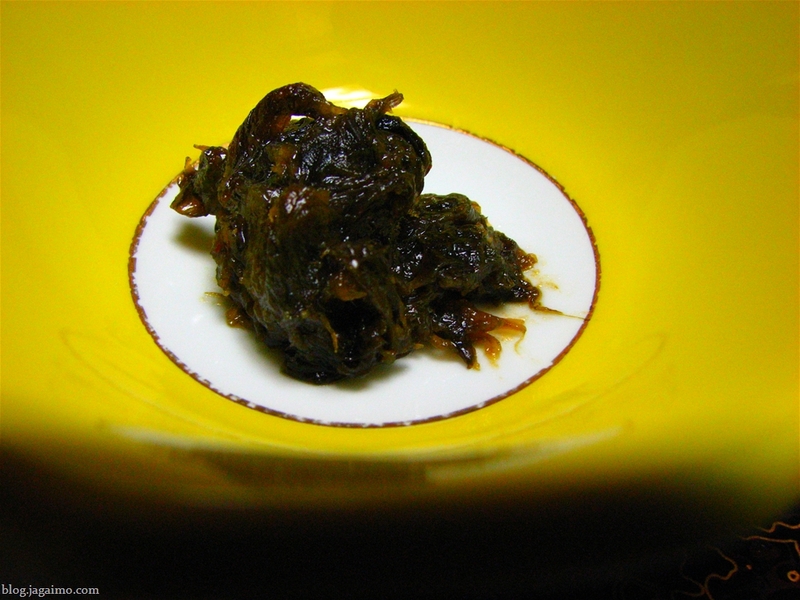 A specialty of northern Japan, and particularly popular in Iwate and Akita prefectures, Kiri-tampo are usually made with uruchi-gome, which falls into the category of everday rice. 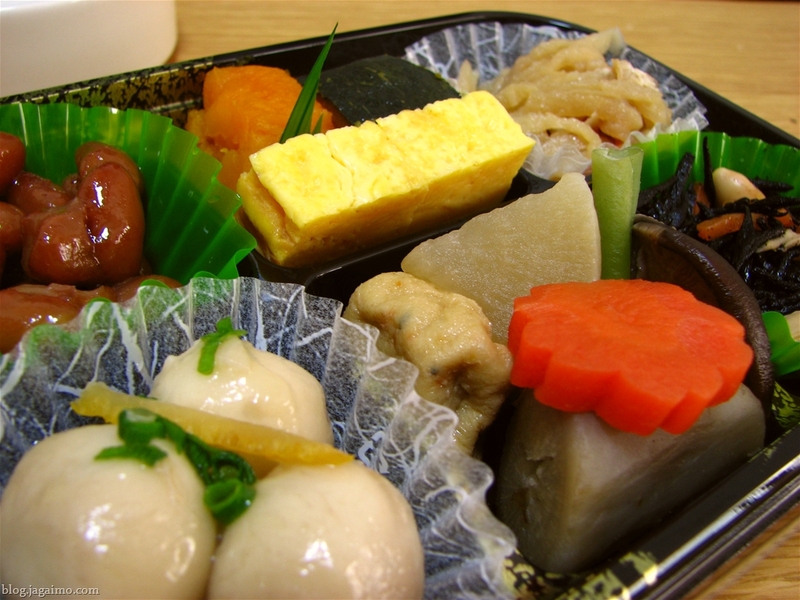 The other two categories of rice are mochi-gome, the pearly glutinous rice, and saka-mai, which is riced used for brewing sake. We stopped at a small lake-front gift shop while between cities in Aomori. We weren't in any hurry to do any actual shopping, but we started looking at the types of things offered as fancy Aomori omiyage so that we could be suitably jaded by the time we were actually ready to buy. 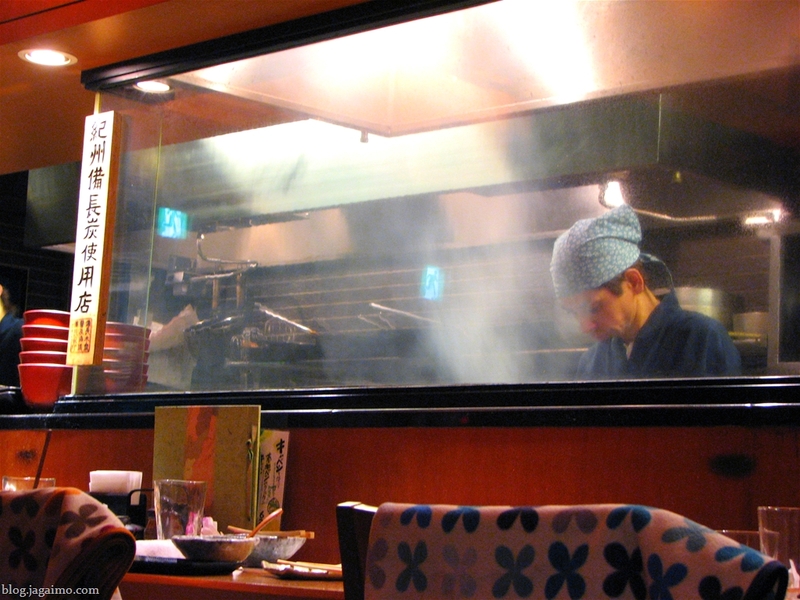 I was sucked in by a little storefront window where a woman was busy grilling kiritampo over hot sumi, Japanese oak charcoal. We had to have one. Each. Although breakfast was heavy, we hadn't really eaten a real lunch, so this was a nice light snack, and very reasonably priced. We placed our order and the obachan handling the grill suggested we head upstairs to sit down, where we could sit in relative comfort facing the lake. Five or ten minutes later, our kiritampo arrived, dressed with a sweet-salty miso flavored tare (sauce). It was far more than we ever hoped it to be. For just 100-yen, you could use this old-school tabletop device to obtain an all-knowing omikuji, complete with horoscope. I think most of the serious packing waited until morning, but we had to wake up around 5:30 to make sure we could get to Tokyo station in time to grab breakfast and to make the shinkansen train. 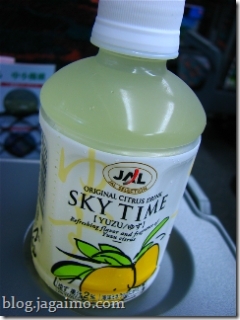 I grabbed an overly-sweet yuzu drink from a vending machine to take on the train... 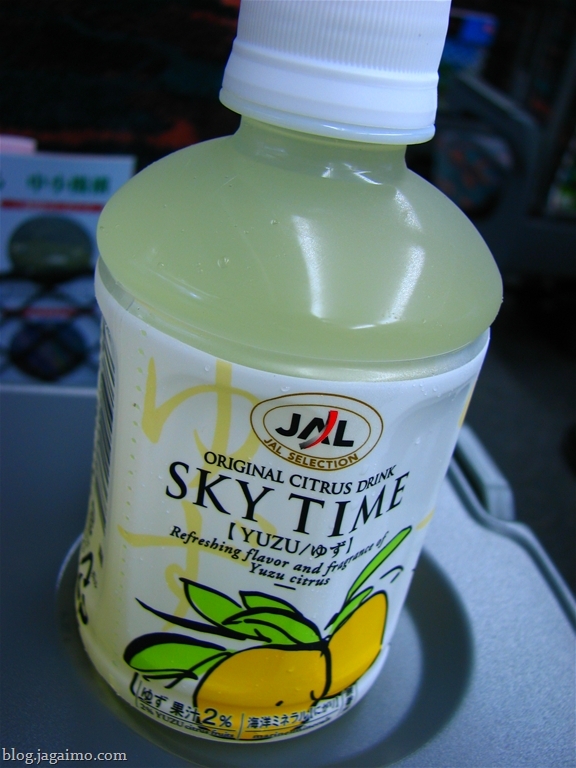 I tend to make one that's closer to 4-5% yuzu at home, but mass production has certain cost constraints... the stronger-tasting yuzu drinks in Japan I've found tend to be about 200-300 yen for a small glass bottle... this was a bit more generous in size, but is only 2% fruit juice. 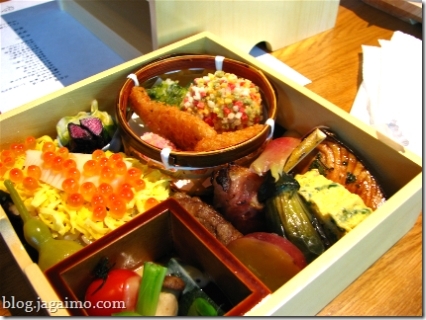 Hiromi picked some reasonably vegetable-heavy bento... 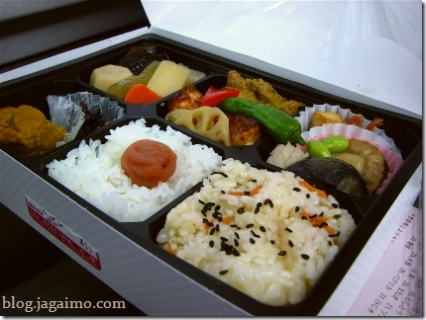 There's no such thing as a vegetarian ekiben (train station bento) anywhere in Japan that I've seen. 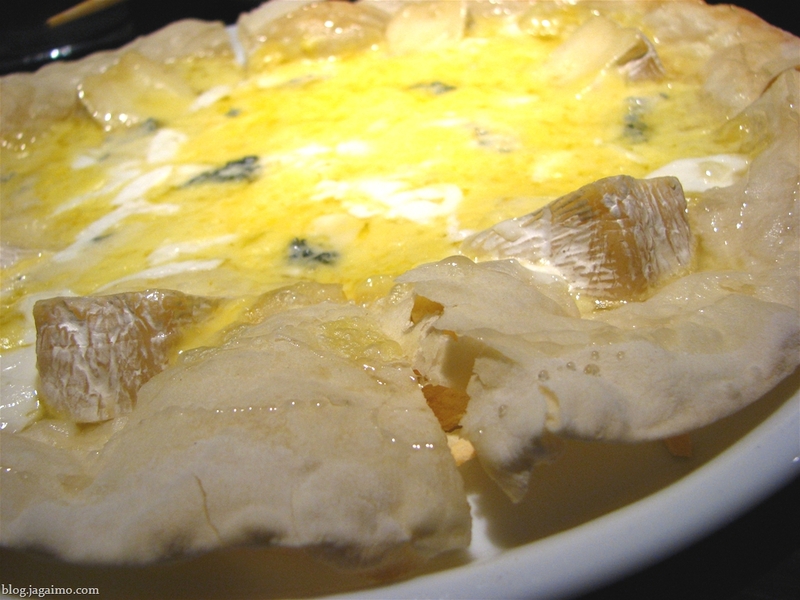 This one, true to its description, was full of vegetables, but also had its fair share of animal bits. The two bento sustained us for the three hour train ride north. 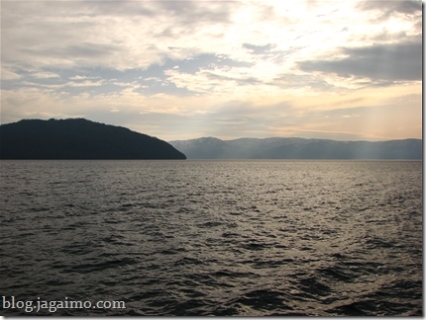 At our destination, Hiromi picked up our rental car and took us the rest of the way to our destination, on very little sleep, while I crashed in the passenger seat, mostly oblivious to the length of our trek across Aomori prefecture. 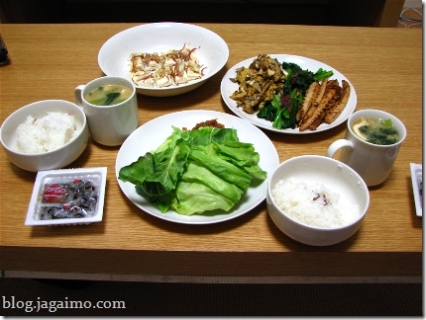 We had a leisurely morning one day and decided to stay home for lunch. 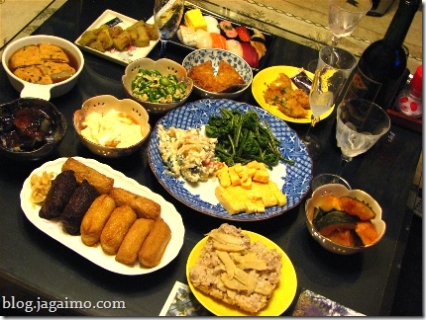 We took advantage of some food Hiromi's parents had sent us away with, all acquired at a supermarket. The souzai (side dish) set, ready to eat, included several small portions of simple dishes that are easily prepared in bulk, but rather time consuming to do in small quantities. At home I've made some variation of almost all of these dishes, but rarely all for the same meal. I don't usually buy a lot of convenience foods in the U.S. 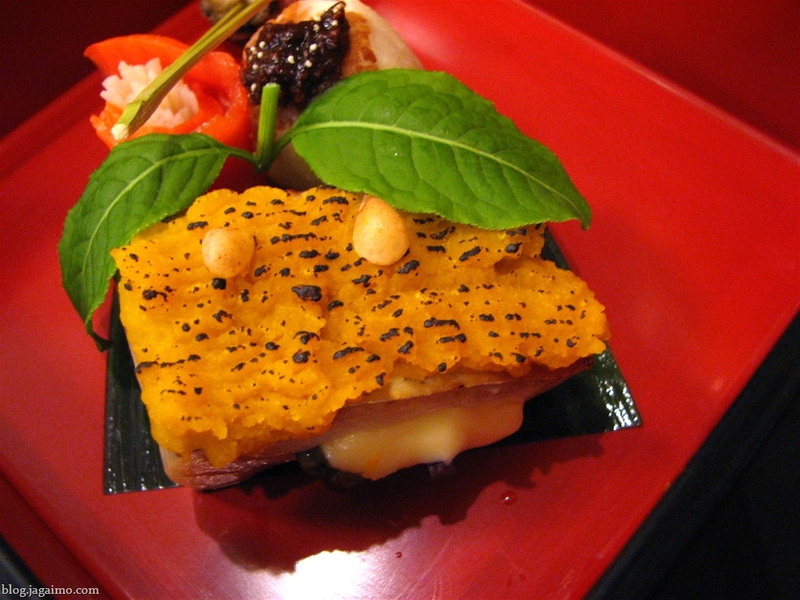 Some sweet-savory beans, tamagoyaki, kabocha no nimono (simmered squash), one aemono, a little hijiki with moyashi, and two other simple nimono. 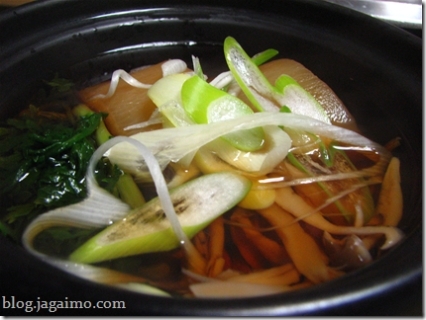 One contained gobo (burdock root), daikon, carrot and ganmodoki. 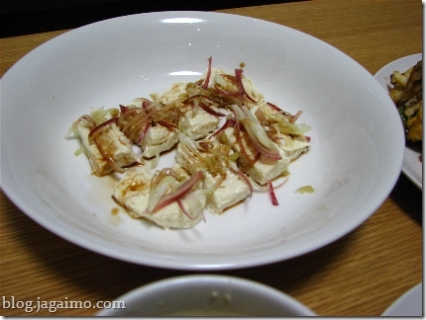 The other is a mildly seasoned satoimo (small taro potato) dish with scallions and a little bit of yuzu peel. We also had some black sesame, starch-thickened, gomadoufu, which came with a little sauce packet. 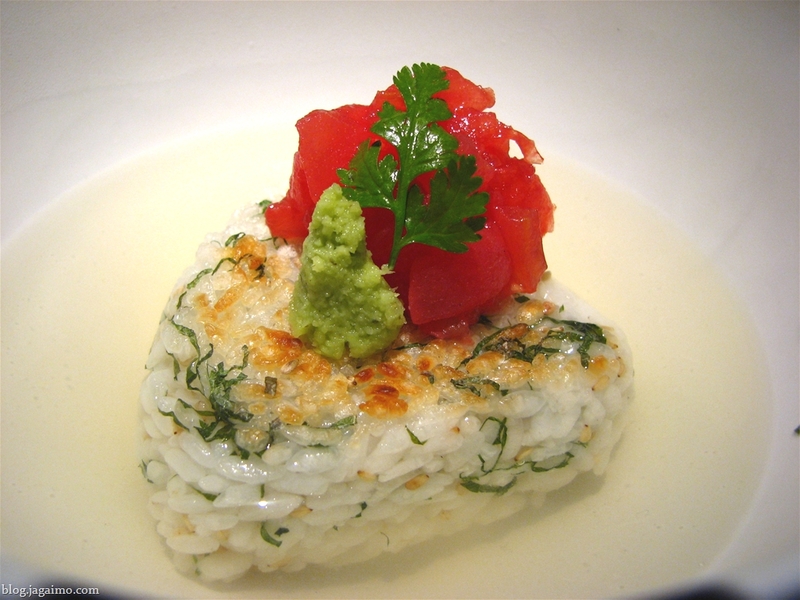 We only needed to prepare a little rice to accompany this to have a fairly decent everyday meal. 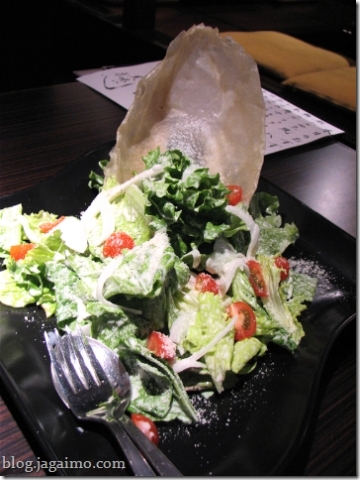 On the Sunday before Golden Week, Hiromi had a practice session to attend, so we needed to have a late dinner. Ochanomizu completely clears out during Golden Week, as it's mostly populated by university students, so nearly every place we walked by had just closed for the evening. Most of the shops closed around 8:30 or so, even if their signs indicated that they were customarily open much later. An incredibly intoxicated woman just outside of one restaurant loudly offered a bottle of something that was allegedly jasmine tea to everyone within earshot, and some of her friends humored her, tasted something that was likely higher proof than the average bottled tea, and spit it out onto the street. 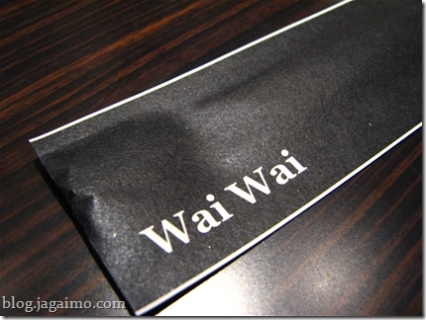 We discovered that the restaurant around which they were congregating was still open. The restaurant promised we could still eat if we coult get all our orders in within about 30 minutes... We were up for the challenge. 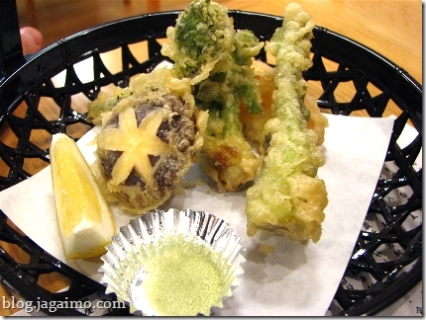 The one caveat is that the shop specializes in yakitori, grilled chicken (and assorted parts) on skewers. 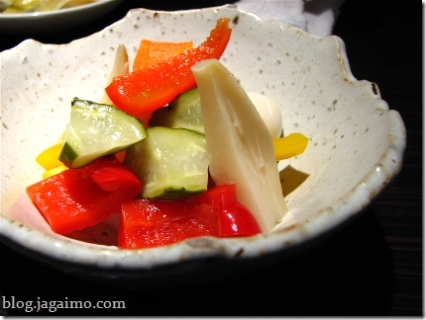 Fortunately, many yakitori shops have a number of vegetable options, and we happened to stumble into one with a surprisingly long menu. We started with these allegedly seasonal drinks made with ryokucha (green tea). 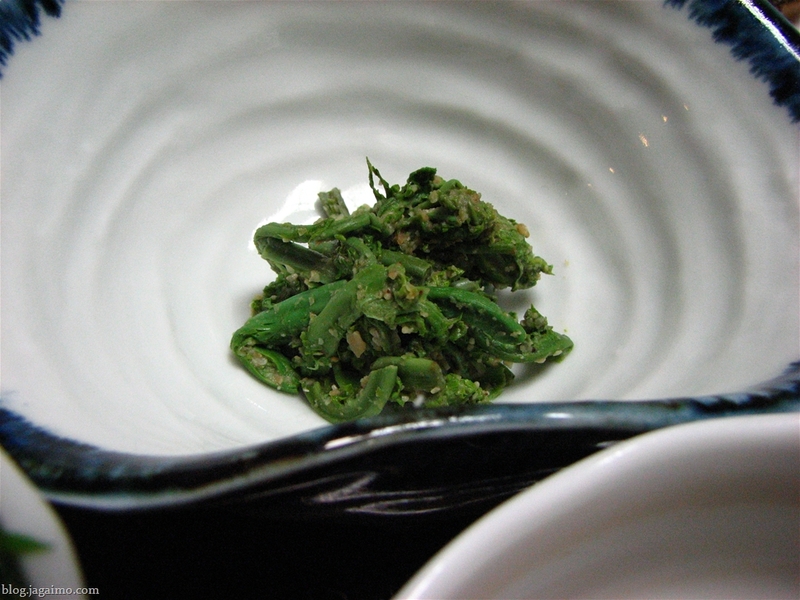 Mine had soba-cha and shochu in it... thanks to the toasted buckwheat, it resembled a slighlty alcoholic genmaicha with a pronounced buckwheat aroma. 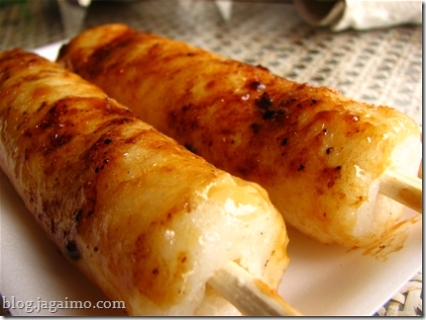 Our first thing to nibble on... some sort of cheese-filled stick harumaki... My memory of the other ingredients has faded, but it was pleasingly crunchy and creamy. Some bitter greens with a kind of grapefruit dressing, topped with little webs of dried fish and a garnish of katsuobushi. Another example of the sense of humor required to be vegetarian in Japan, perhaps, but the greens and dressing were nice. I always delight in unexpected greatness in simplicity... These were one of our favorite treats of the night. 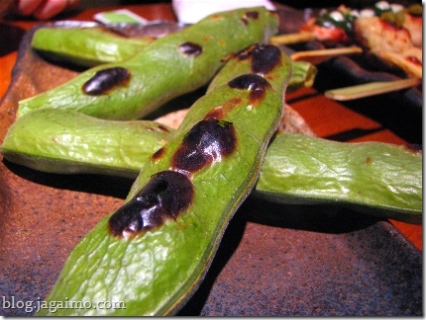 Oak charcoal grilled soramame (fava beans) served with coarse ume (Japanese apricot)-flavored salt. The easiest way to eat this is to out the fava beans one by one and eat with a grain or two of the salt. Another pleasant surprise... 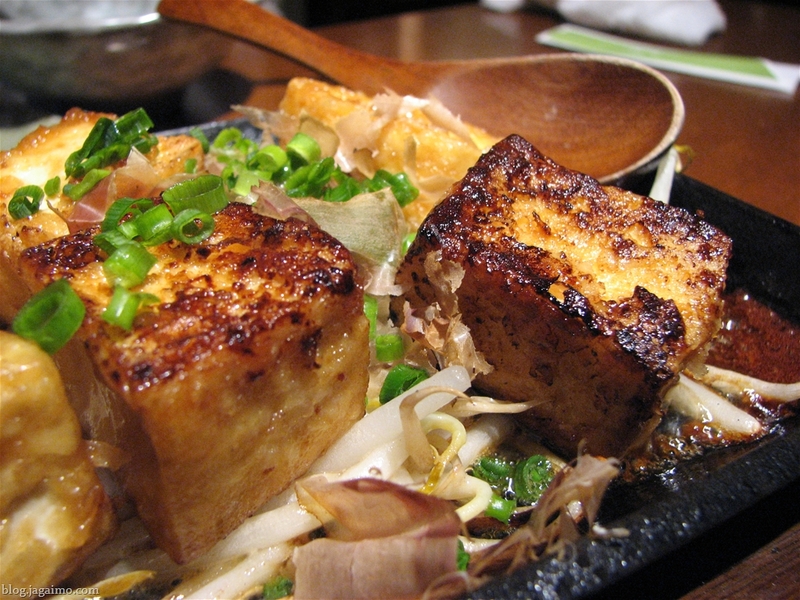 This tofu was served on a small sizzle platter with a sauce made from little more than butter and soy sauce, and tasted surprisingly indulgent. 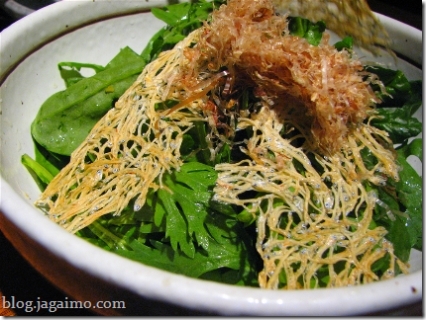 It's topped with negi (scallions), and like so many other pub side dish in Japan, is dressed with some katsuobushi. Tsukune-stuffed shiitake for Hiromi in the background, served with a heavy dose of yuzu-kosho, and grilled bamboo shoots with slightly sweetened miso. It's really hard to get nice bamboo shoots in the US, especially this fresh. I don't know why that is, exactly. 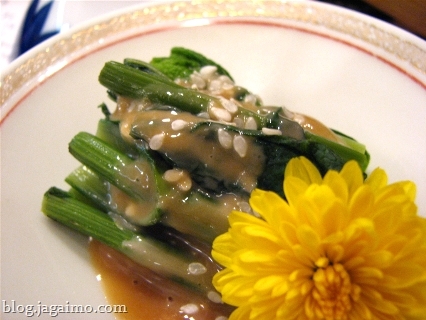 But these were very nice, very appropriate for spring, and they were completely free of the unpleasantly preserved taste that most bamboo shoots in the US have. On a wet and rainy April 28, Hiromi, Hiromi's mother and I trekked to Meiji Jinguu, then briefly toured Shibuya's Tokkyu Foods Show depachika madness. 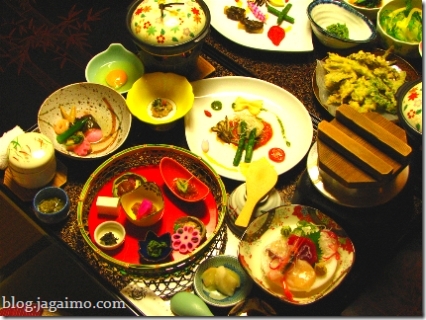 We were planning to have dinner at Hiromi's home that night, so we actually wanted to pick up a few things to take home. 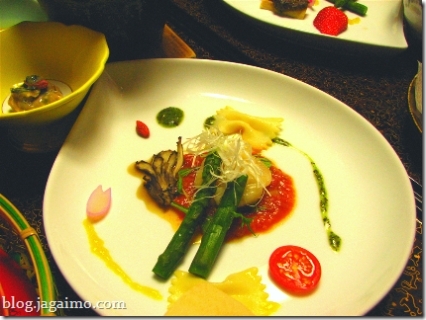 The nifty thing about department store basements in Japan is that you can assemble a fairly elaborate meal without ever needing to whip out a spatula or your handy kitchen saibashi. Not one of the dishes required more than a bit of reheating, although for one of the two grilled eggplant dishes (far left, middle) I chose to make a quick nerimiso to help the two variations stand apart from each other. Even in that case, however, the department store had a ready-to-buy sauce you could take away to remove even this tiny step of production. I also made a quick seasoned soup stock for the big ganmodoki (upper left), but everything else was just a matter of heating, at most, and plating. 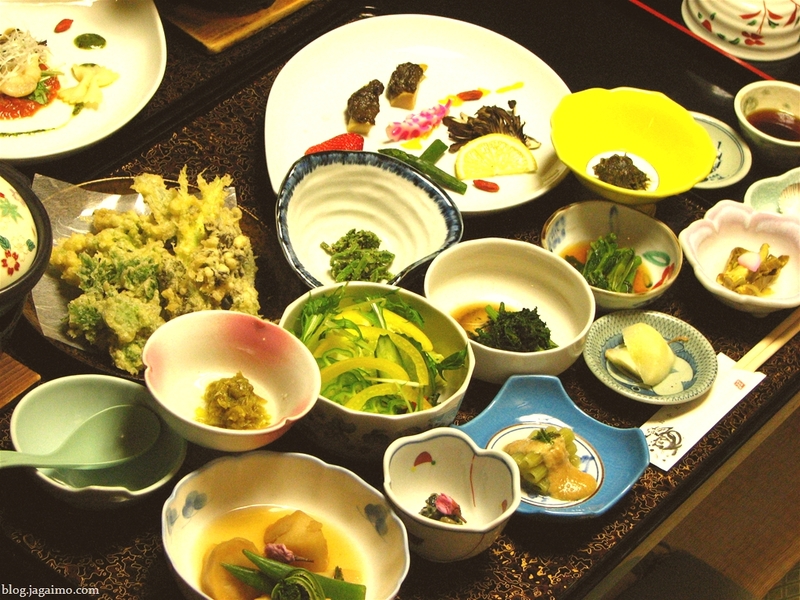 Among the other dishes: Fresh yuba with soy sauce, an okra ohitashi with yuba, two kinds of vegetable croquettes, supermarket sushi, blanched kogomi (a spring mountain vegetable similar to warabi), a vegetable aemono, dashi-maki tamago (a broth-seasoned omelet), takenoko gohan (bamboo shoot rice), and four kinds of inari-zushi. 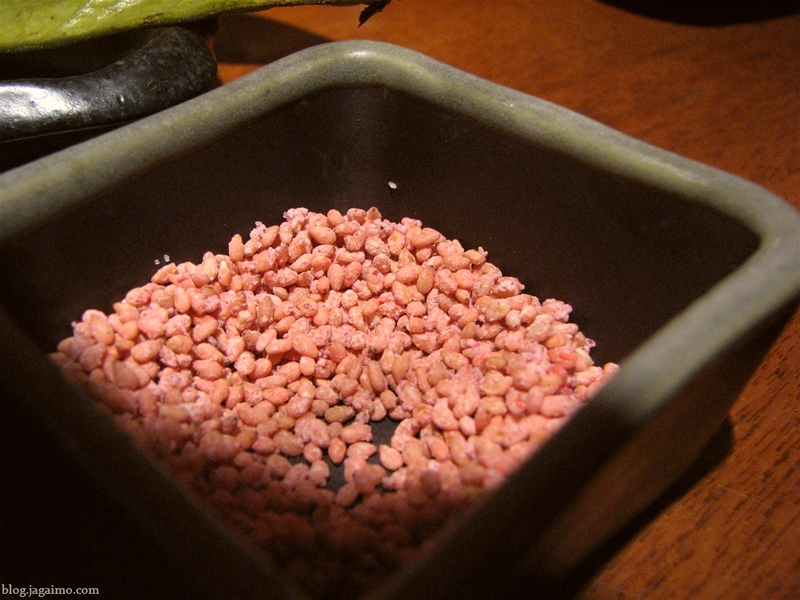 One variety had a wasabi-seasoned rice, another was gomoku, another might have been made with azuki, and the last one had age puffs made from black soybeans. It wasn't all easy, though... A fair amount of time unwrapping, plating and transporting foods from the kitchen to the table made preparation take almost as long as making a simpler dinner might have taken. Of course, the quality was much better than the average takeaway meal at a US supermarket, and everything was nicer than most of what you might find at even upscale urban specialty shops.